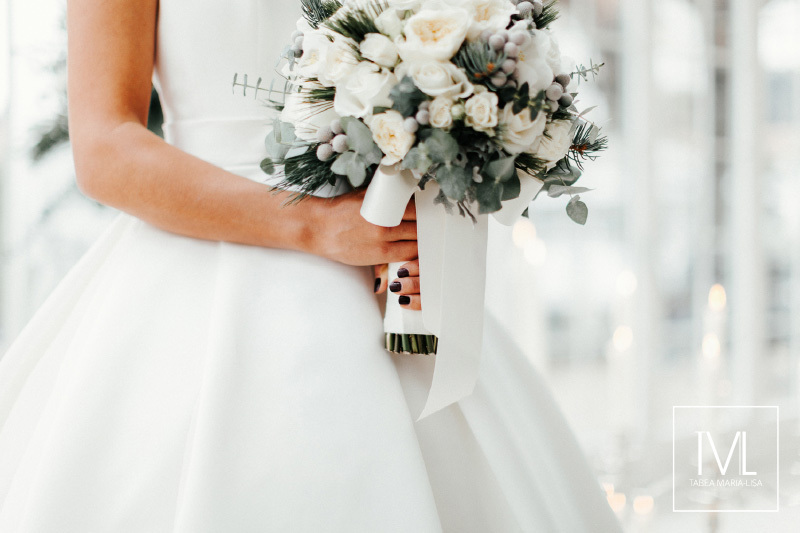 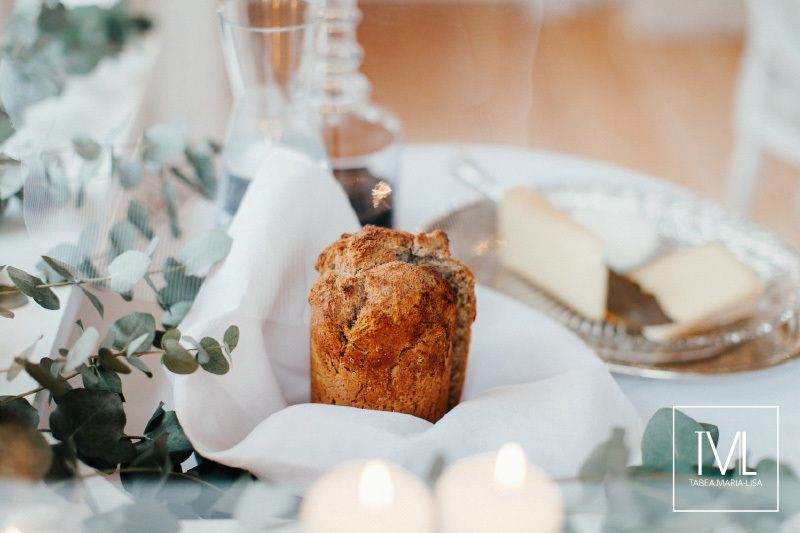 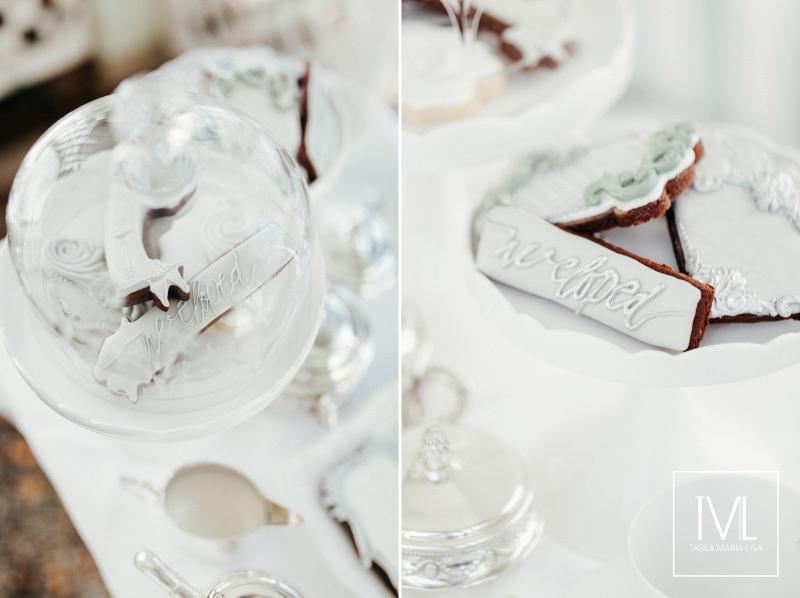 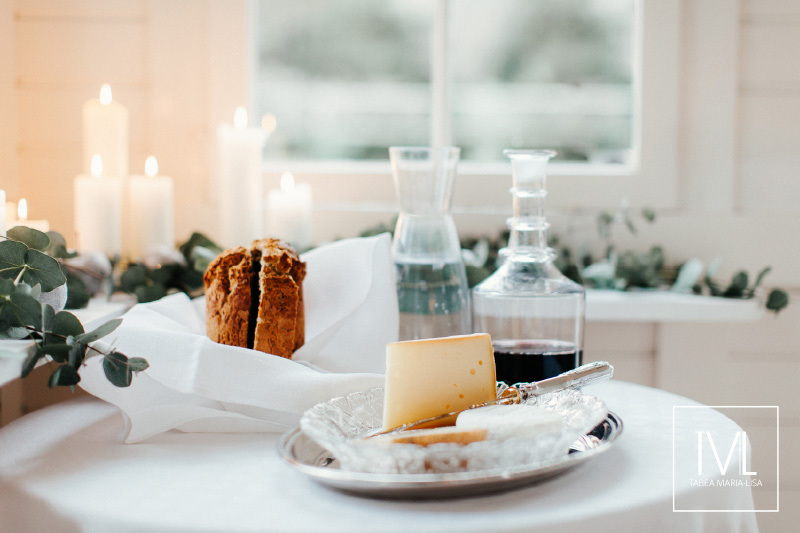 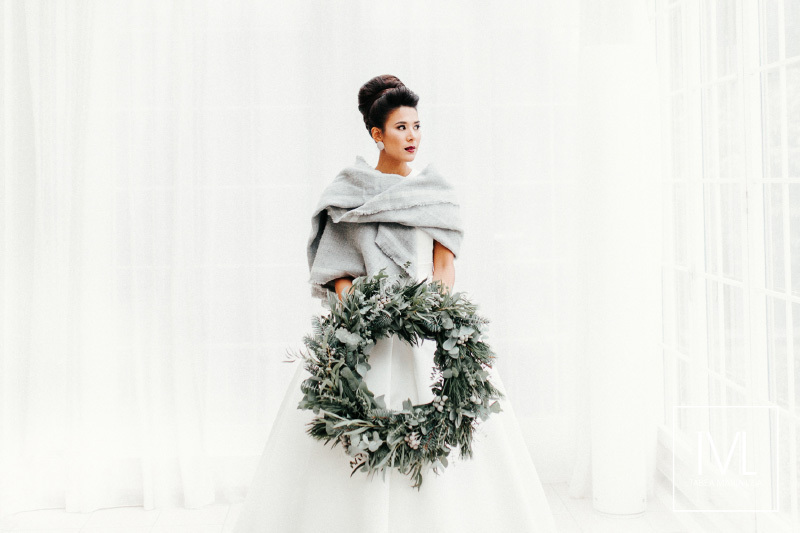 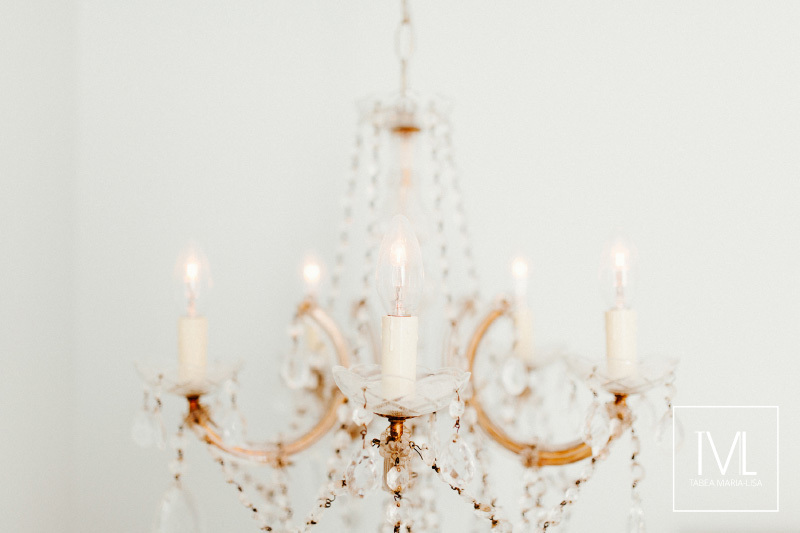 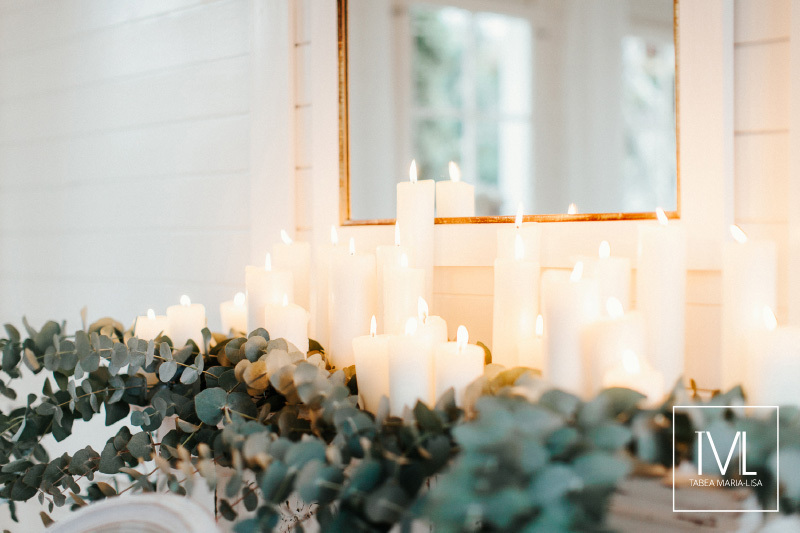 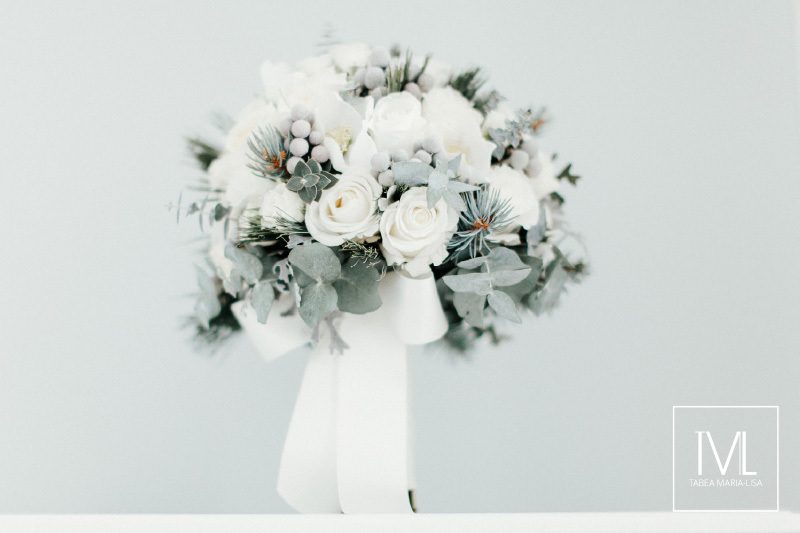 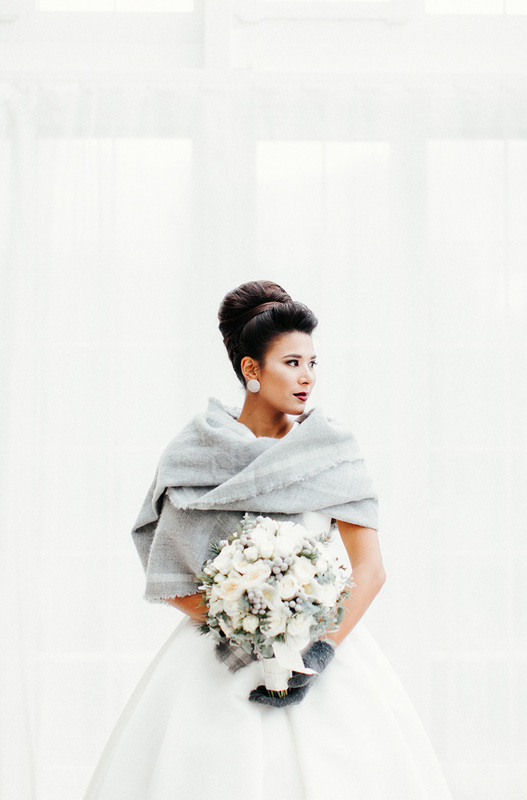 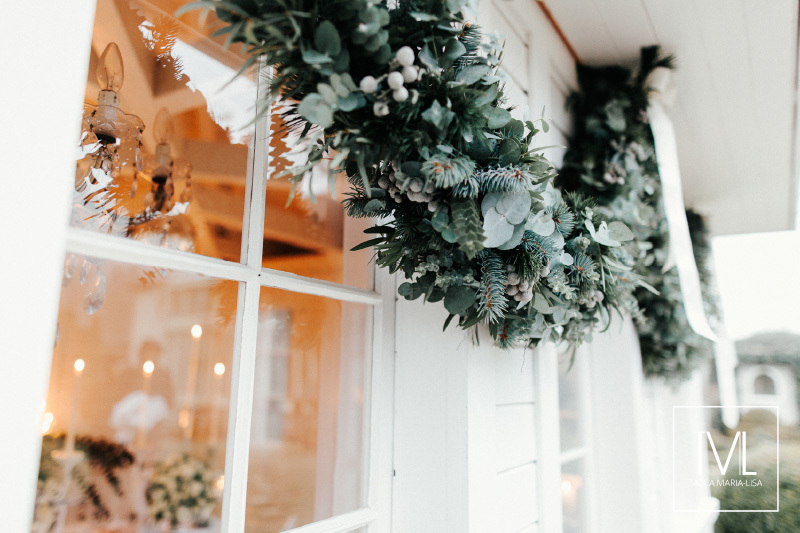 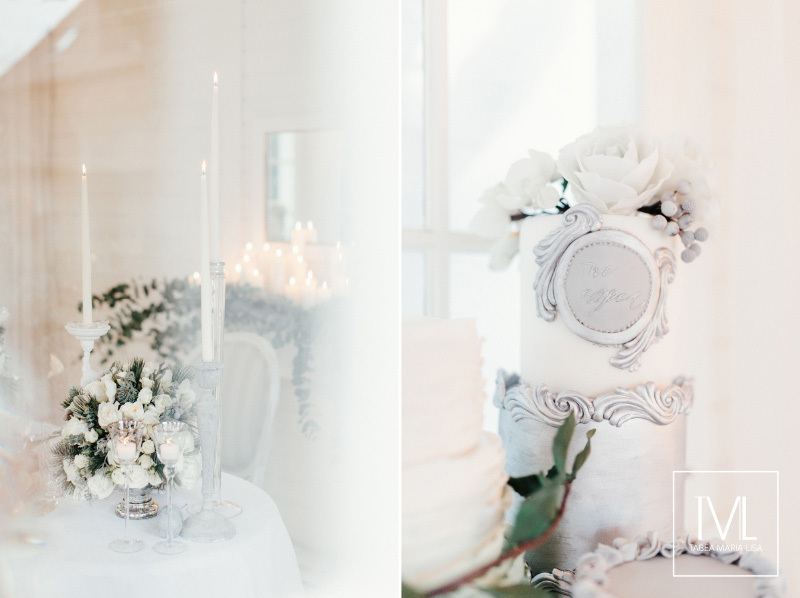 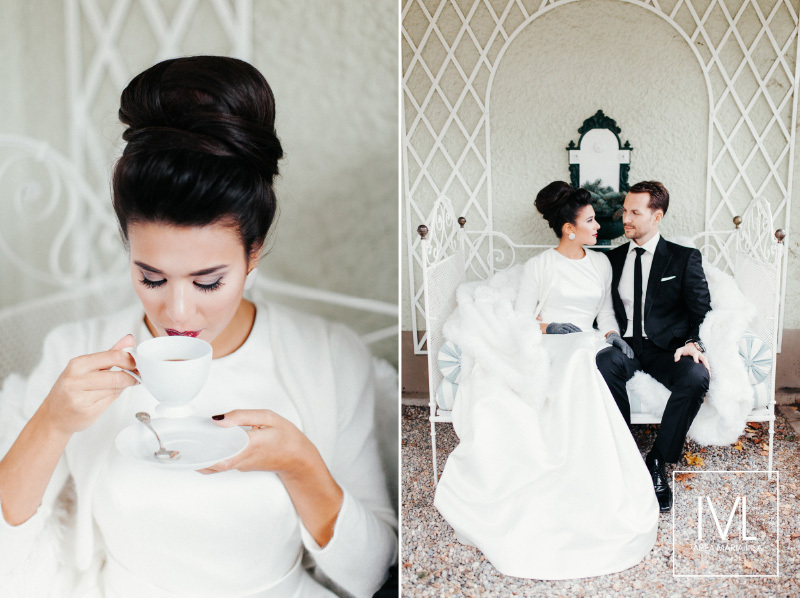 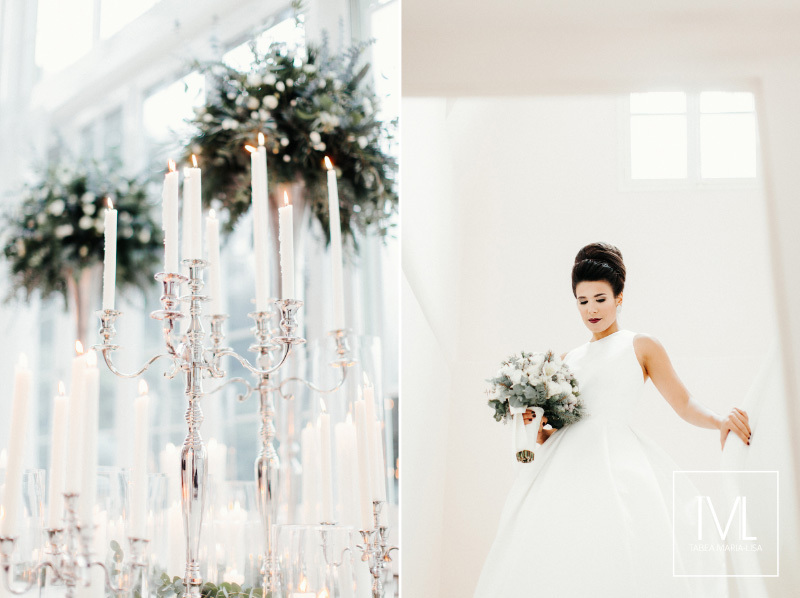 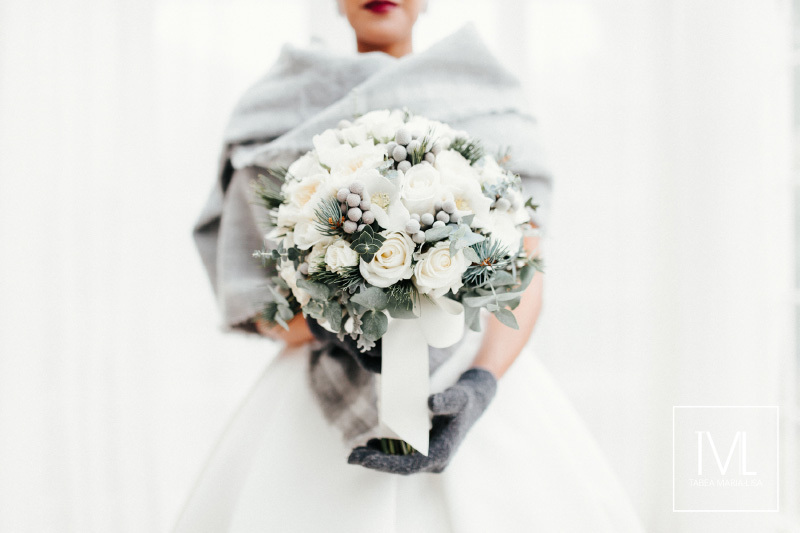 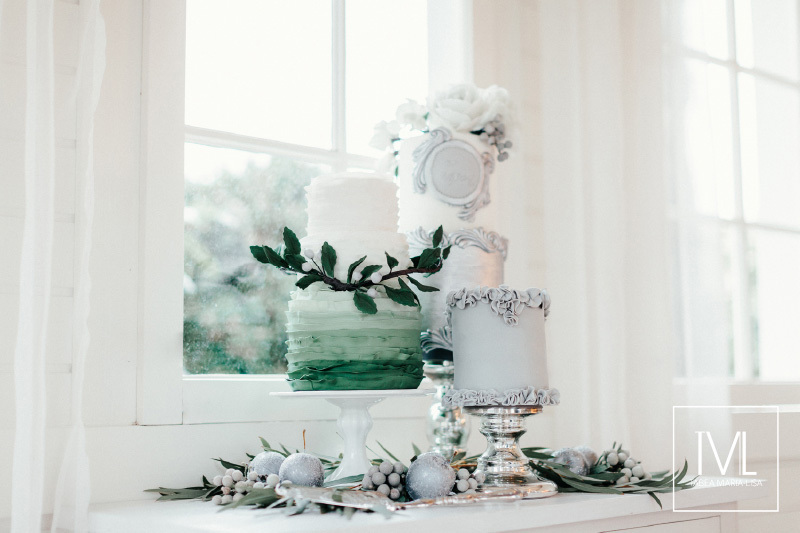 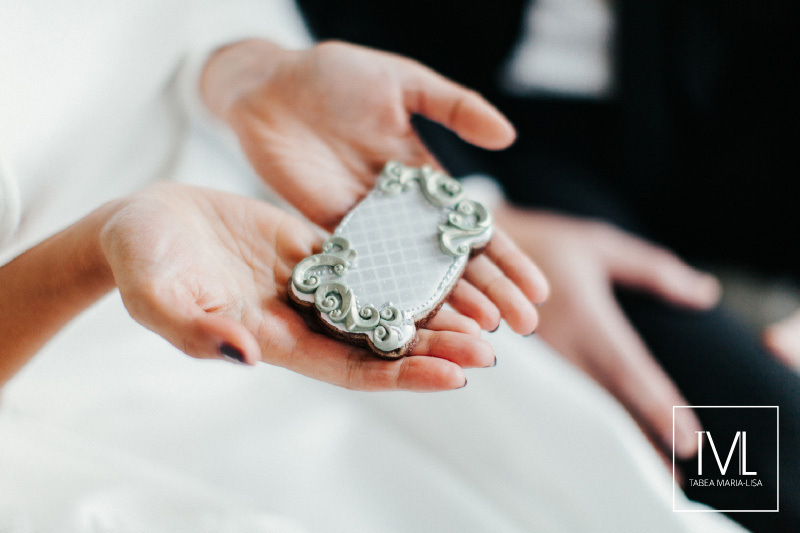 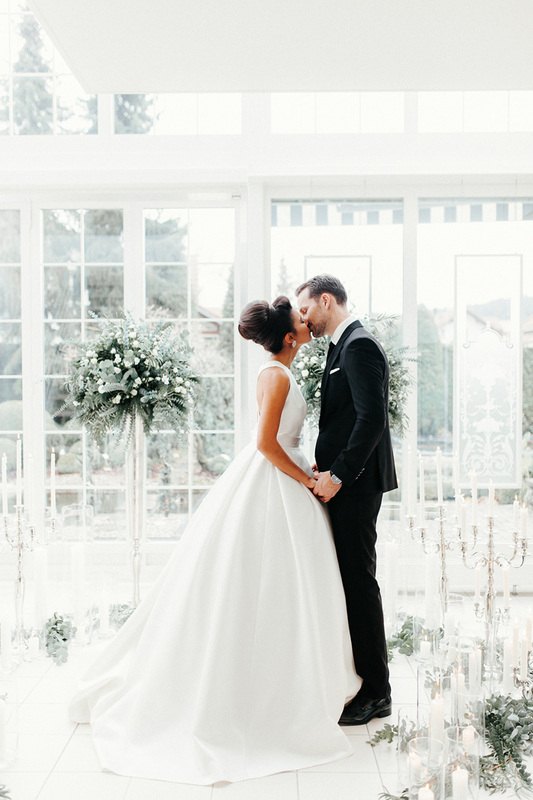 Set in the gray winter fog pulling in silver of a November Day at an enchanting old Private Estate, this Elopement Inspiration Shoot wants to convince any brides who may think that todays Elopements need to be set outside only and can’t be styled with classic elements. 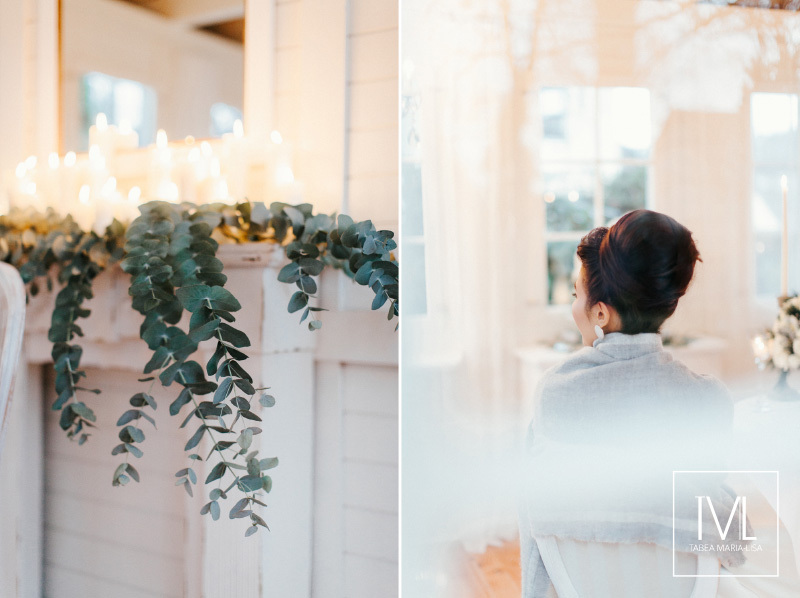 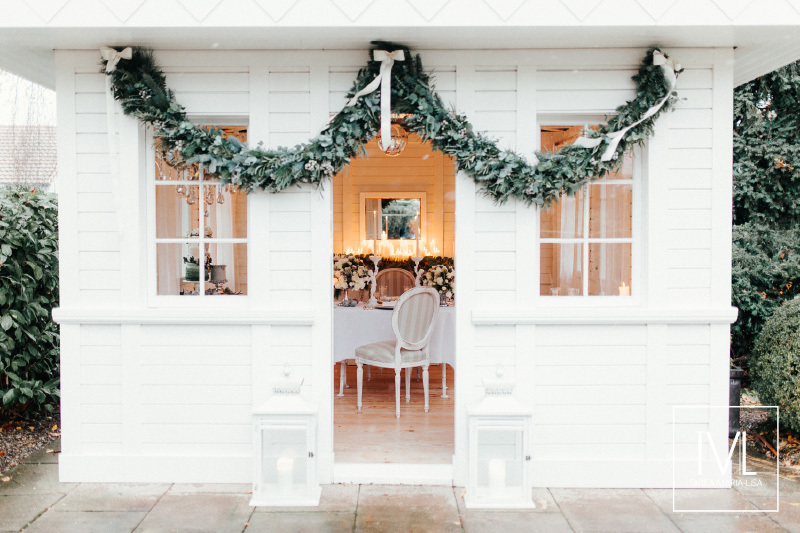 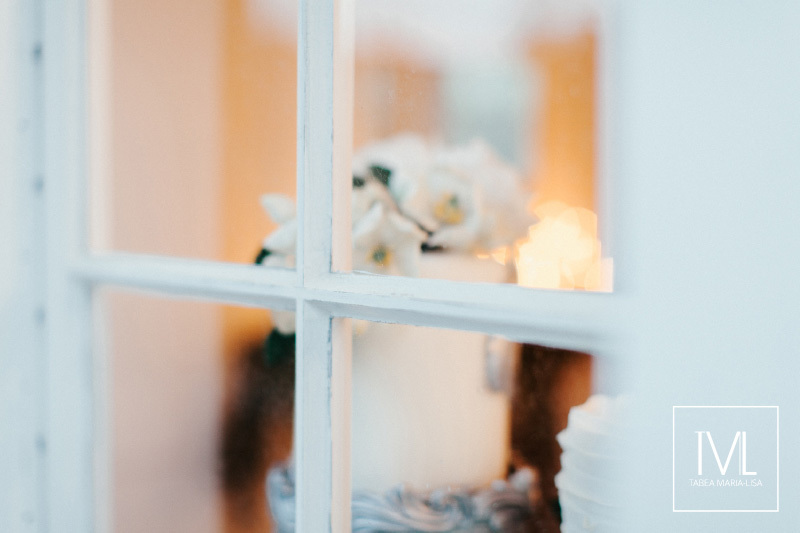 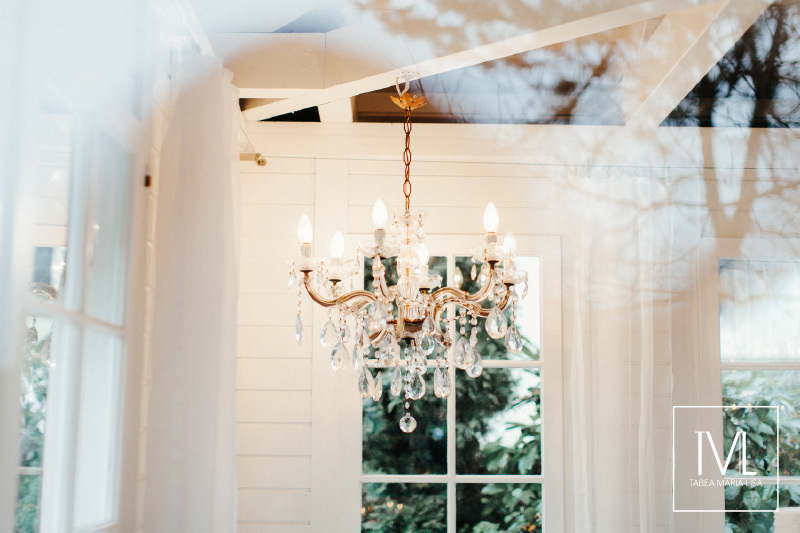 Since Elopements are the most intimate way of getting married we wanted to create that calm, cozy and leisure feeling you get when you’re sitting inside with your loved one and outside it is misty and cold. 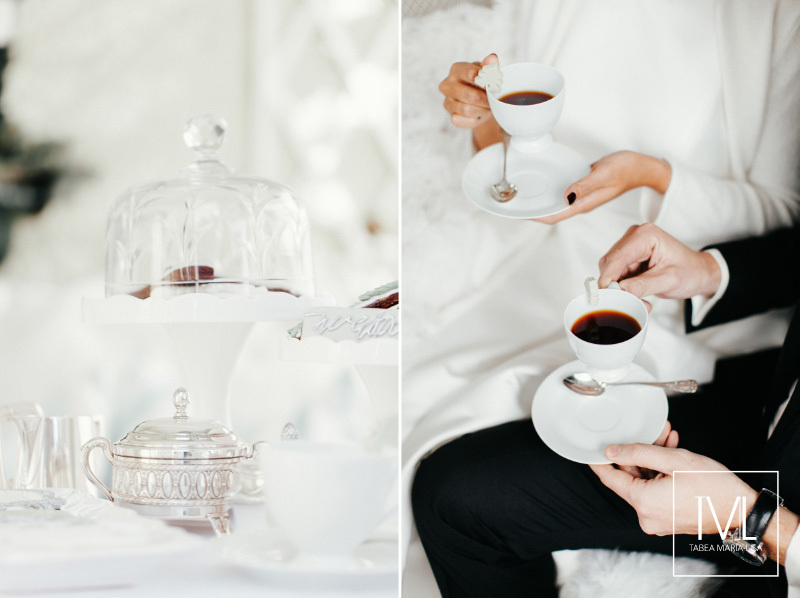 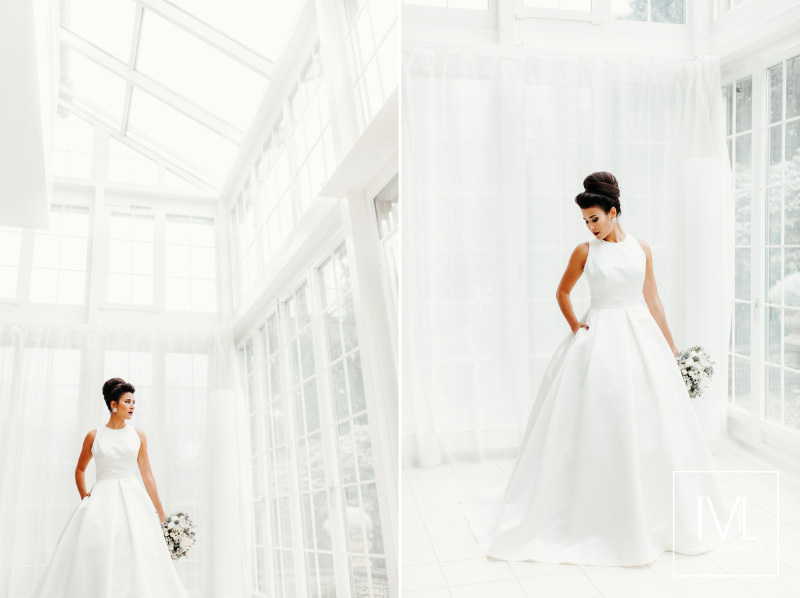 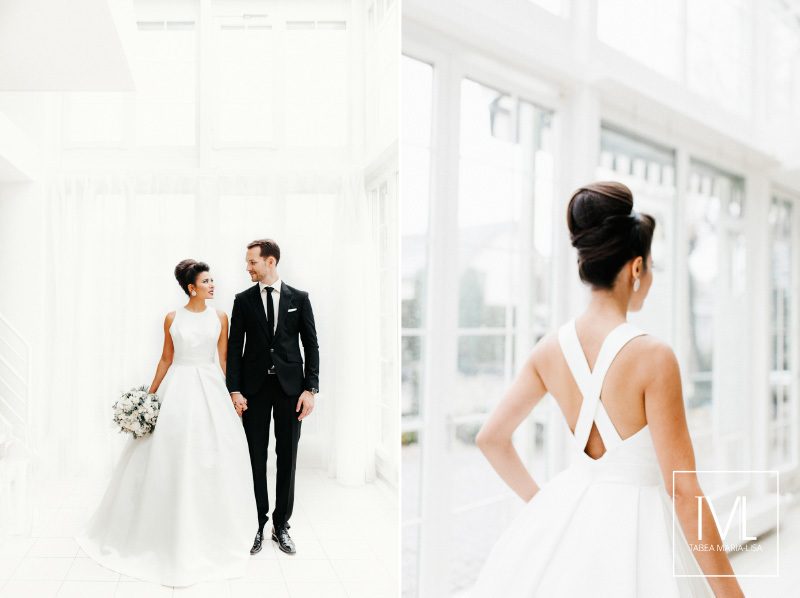 Intimacy and timeless Elegance are the two things we committed ourselves for this shoot since these are two of the most important things our companies – david&kathrin and TML | TABEA MARIA-LISA – are standing for. 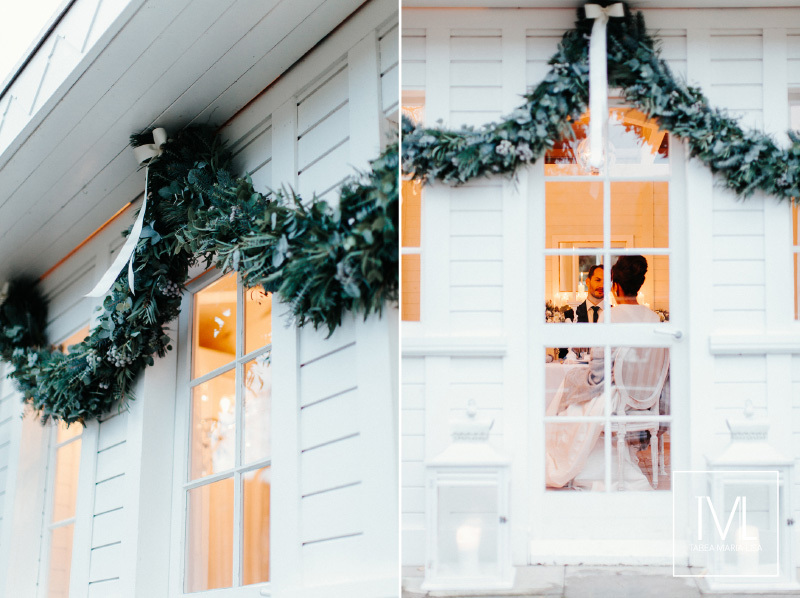 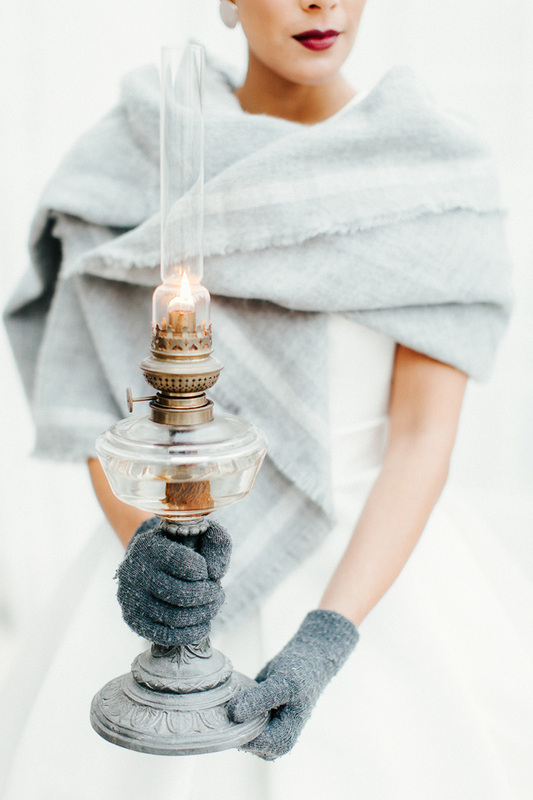 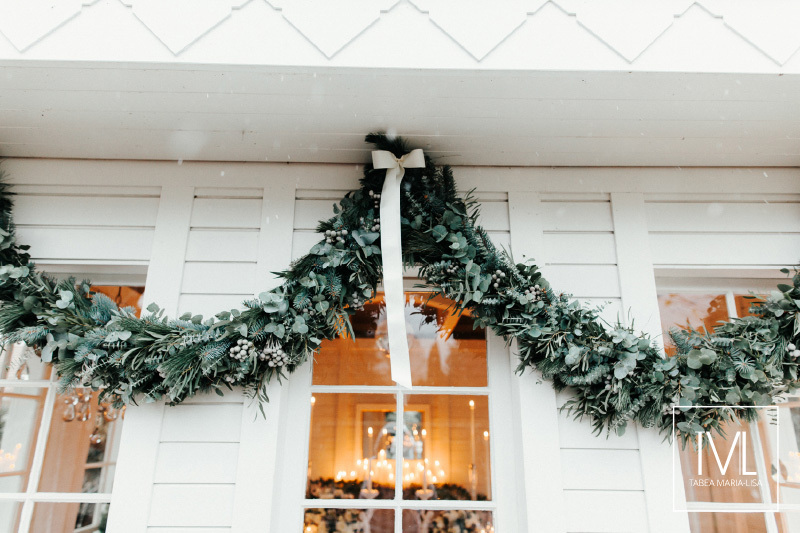 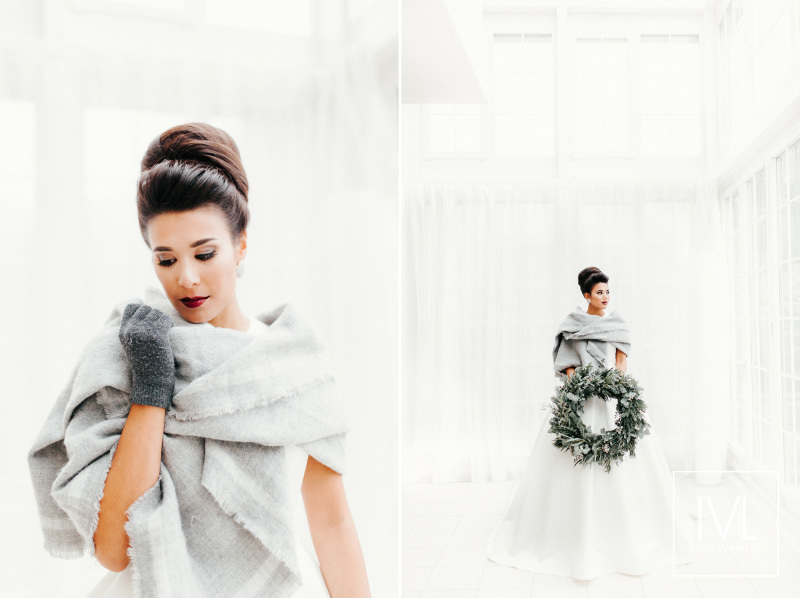 Therefore we found a bunch of very talented vendors to realize our dream of a winter elopement. 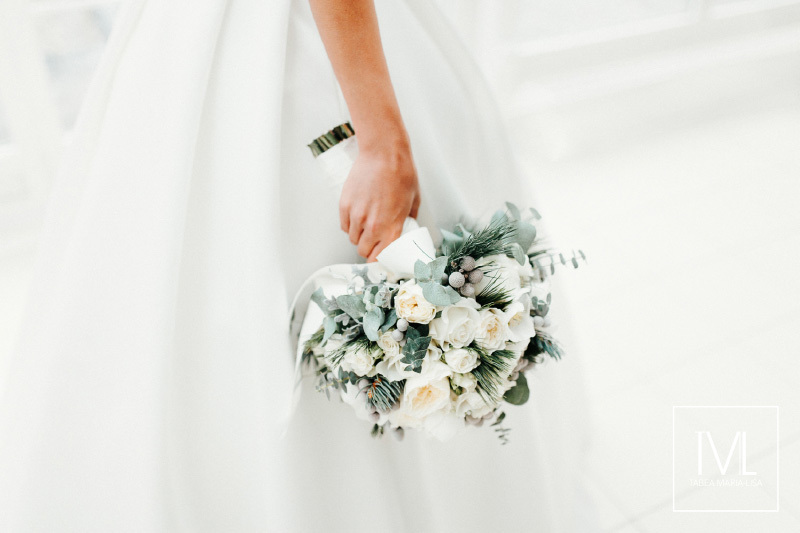 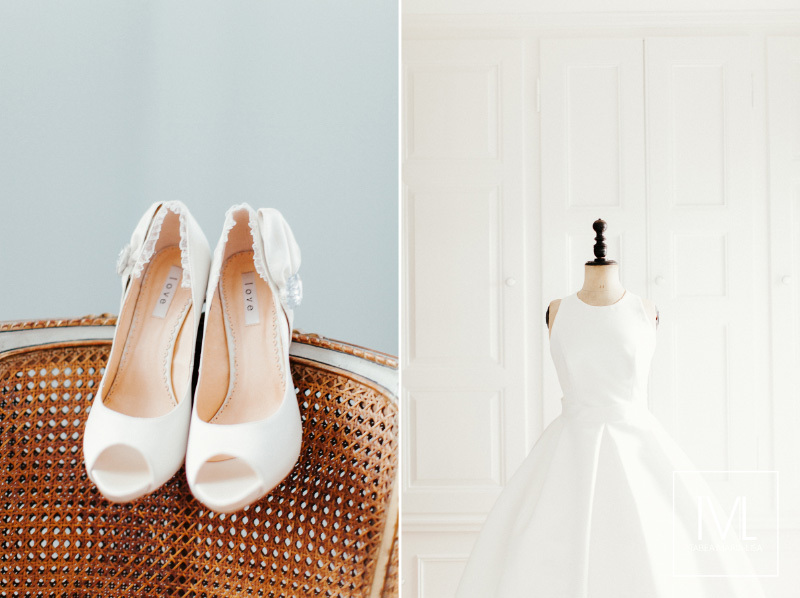 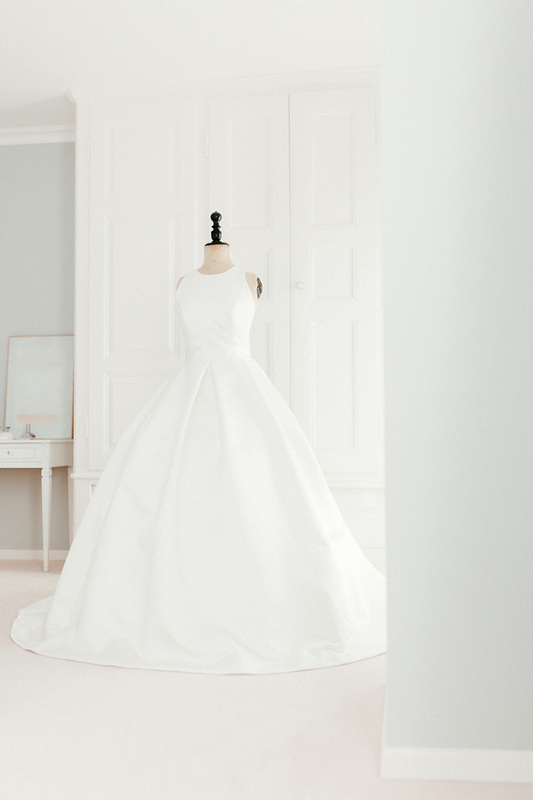 The bride was dressed in a classic and elegant but also fashionable gown from Jesús Peiró – unforgettable the moment when she descended the stairwell and looked like an english countess. 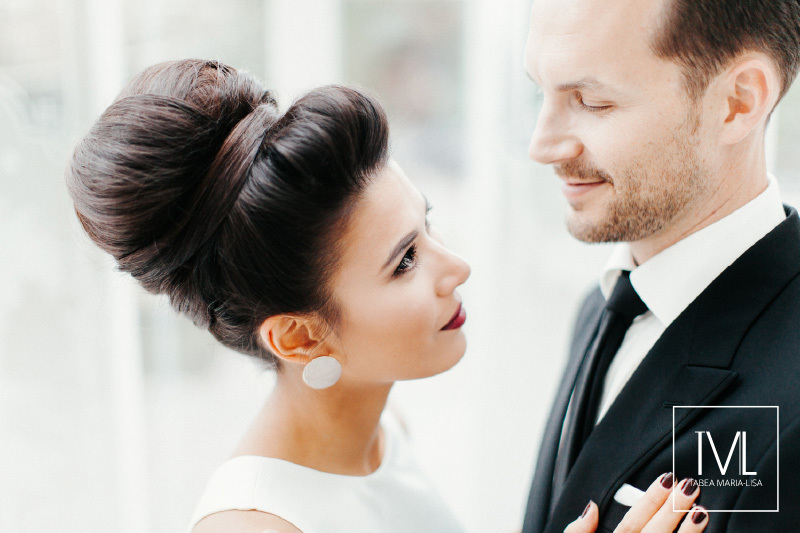 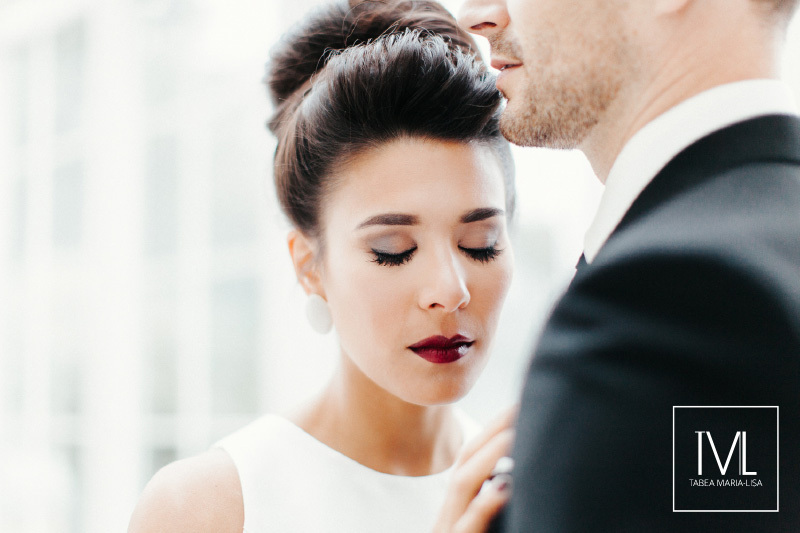 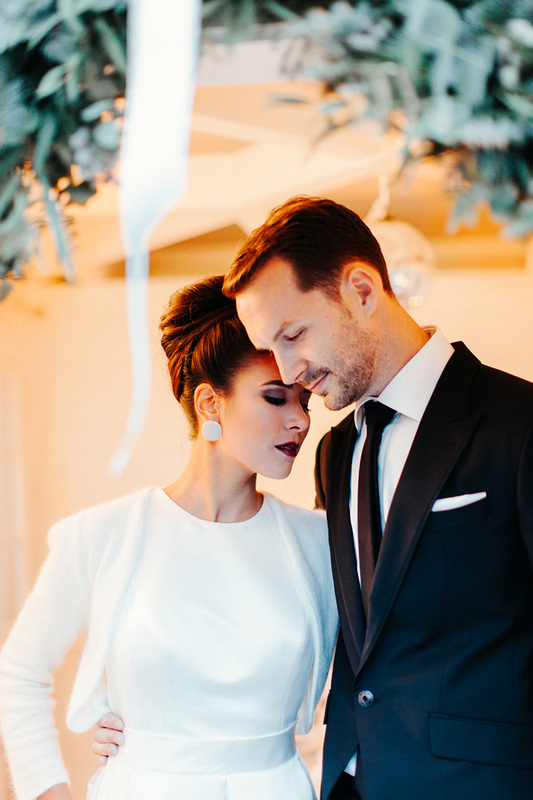 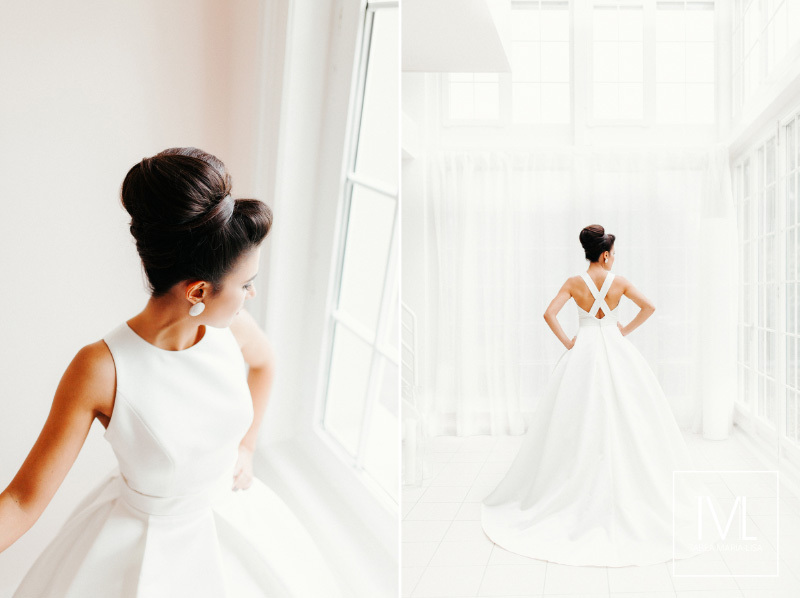 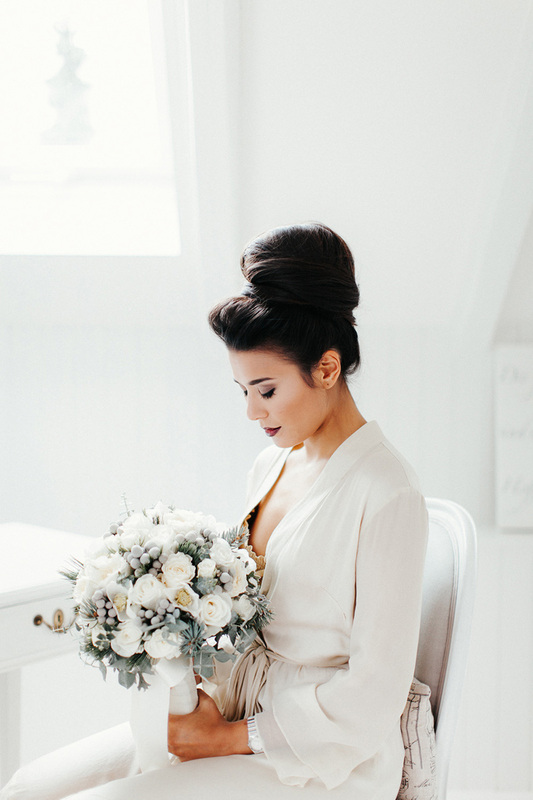 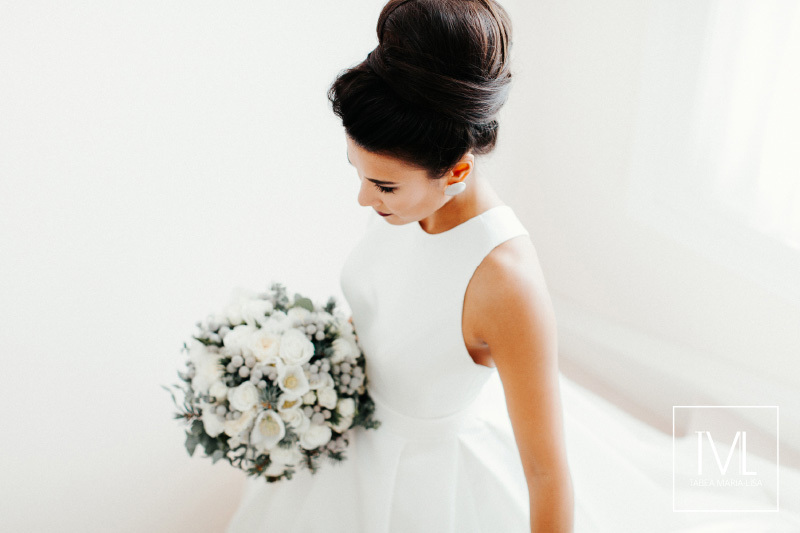 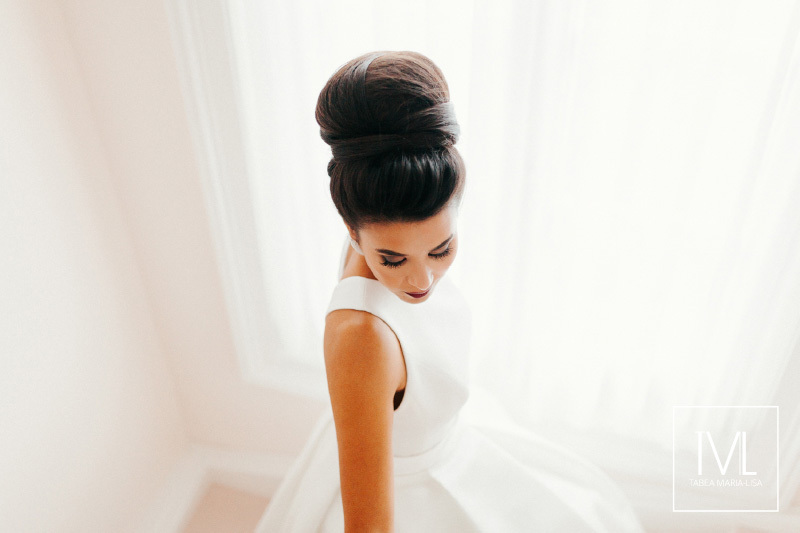 Hair Stylist Natanja created a beautifully classic yet impressive updo and Makeup Artist Nadine completed the styling with a striking look including tempting dark red lipstick. 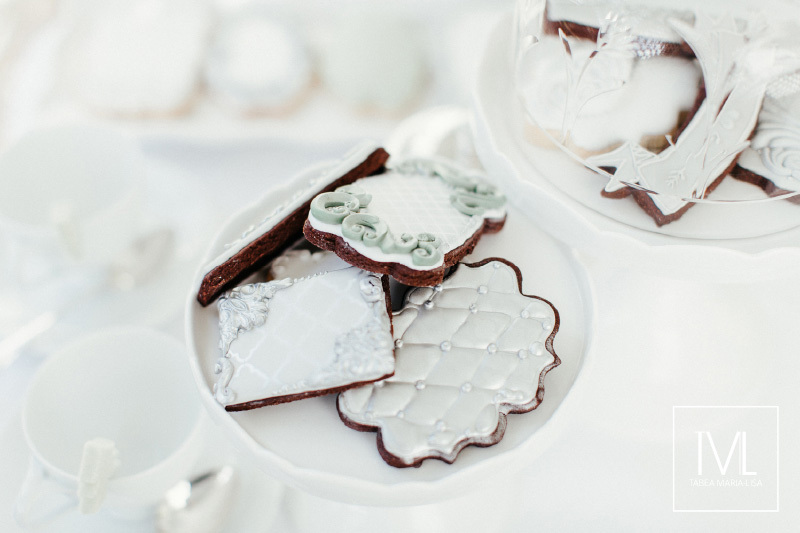 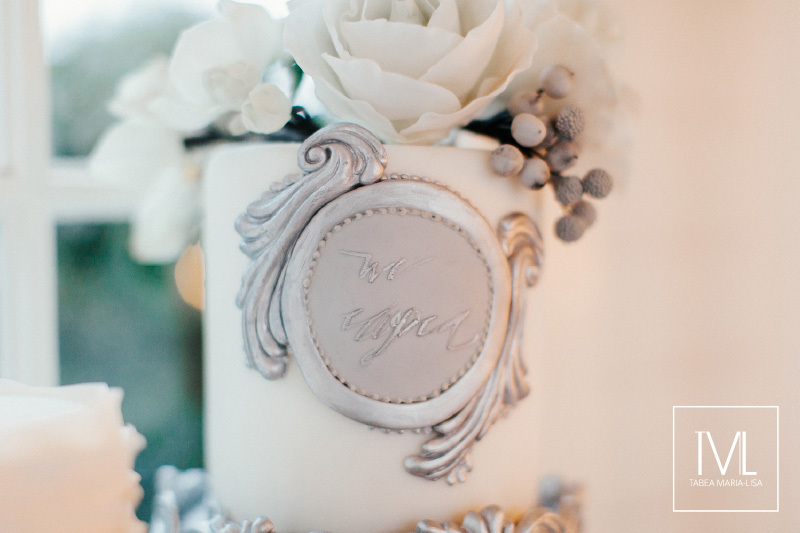 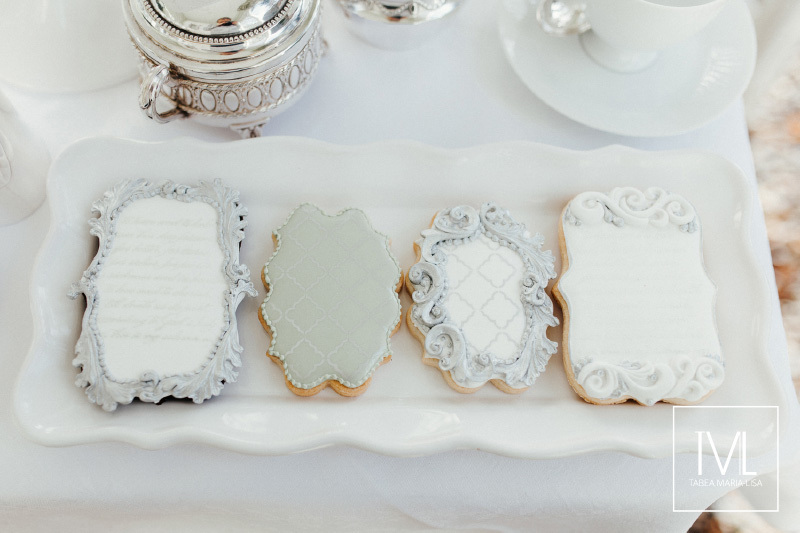 Everything from the luxe wedding cakes and cookies with delectable designs and vibrant details in handcrafted perfection by cake designer Mel, to the soothing tones of grey and handwritten calligraphy in the stationery by yours truly, seemed to shimmer with unique glamour and intimate romance. 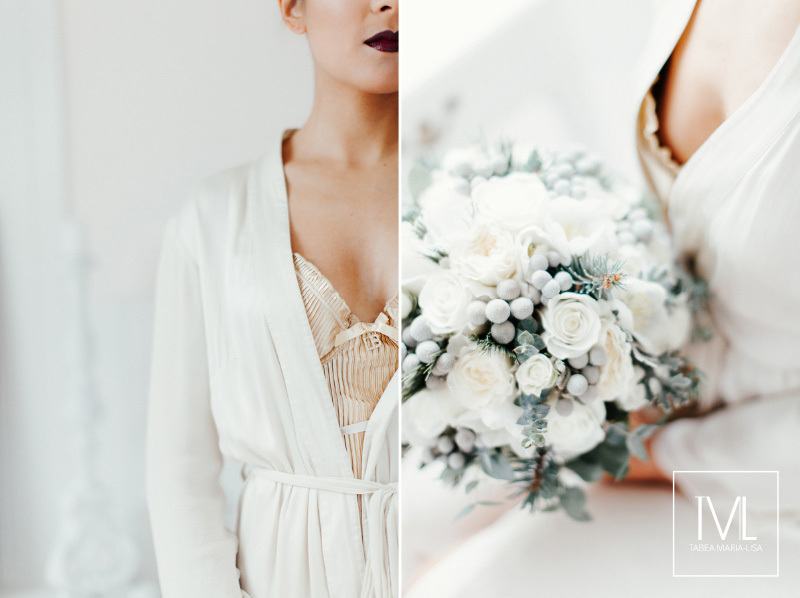 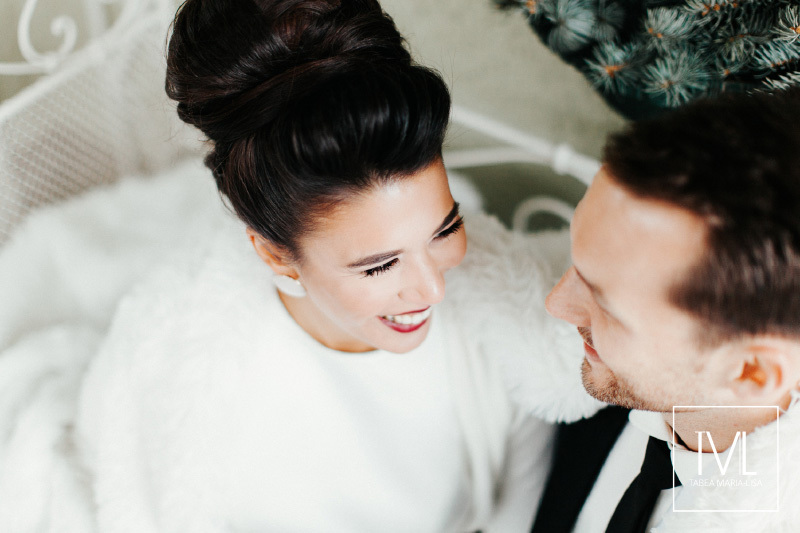 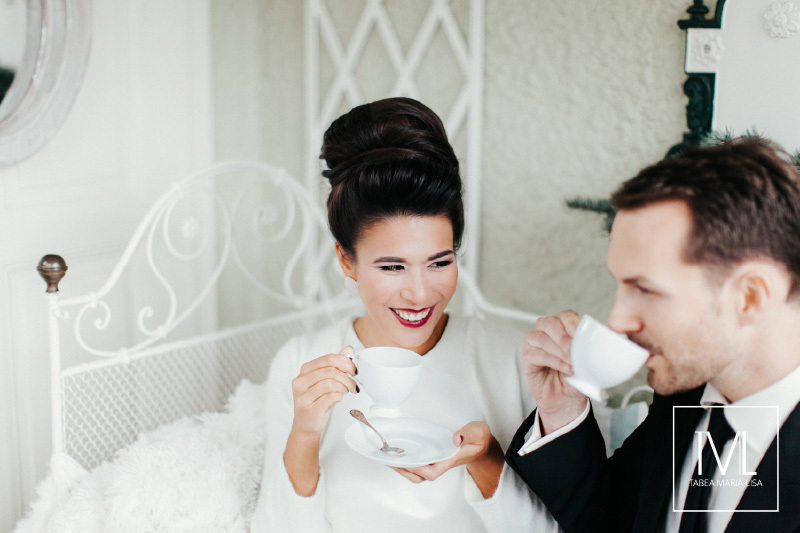 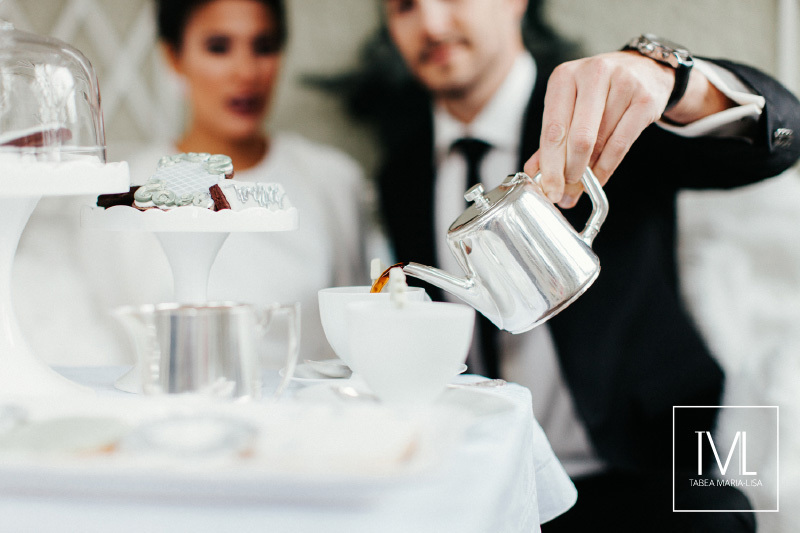 Wedding Photographer and Cinematographer Kathrin and David shot and filmed with such a great compassion and with a direction towards true intimacy to capture the feeling of winter cozyness. 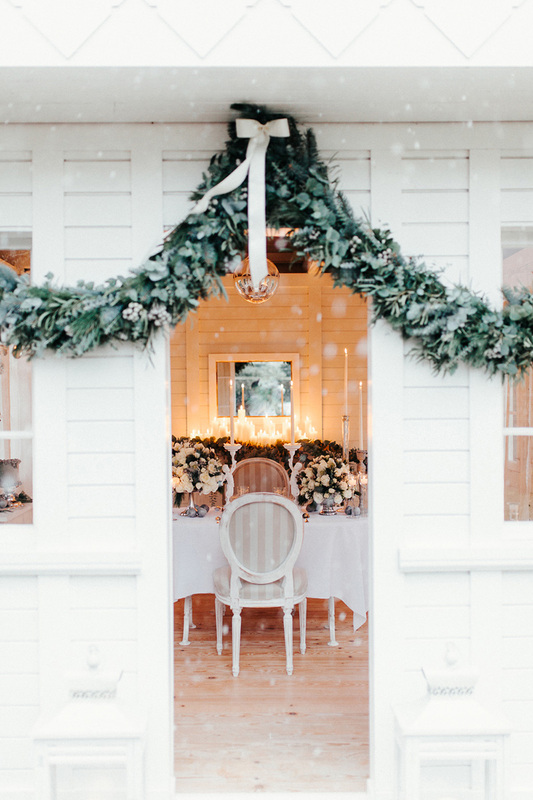 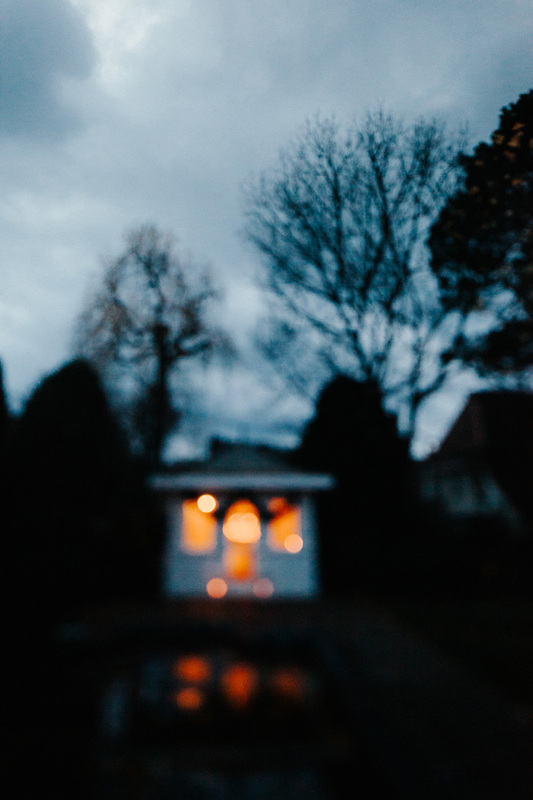 St. Paul couldn’t resits about their passion so during the shoot in the backyard he actually let it snow – unbelievable. 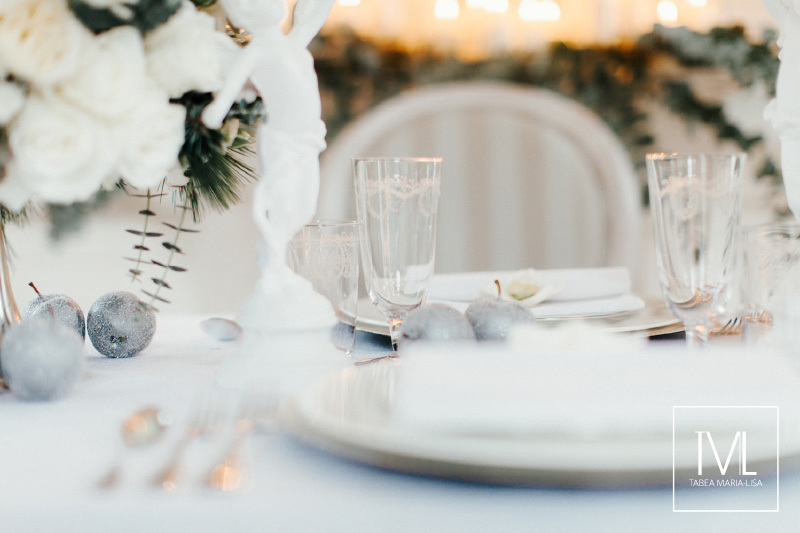 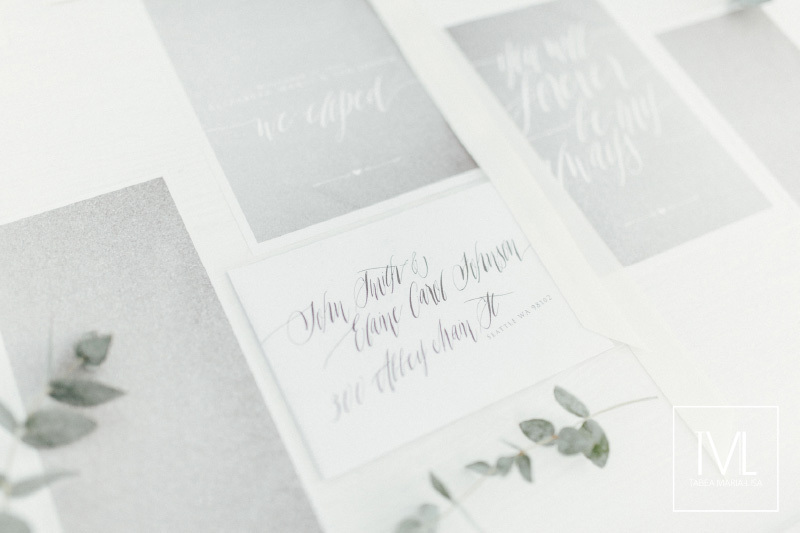 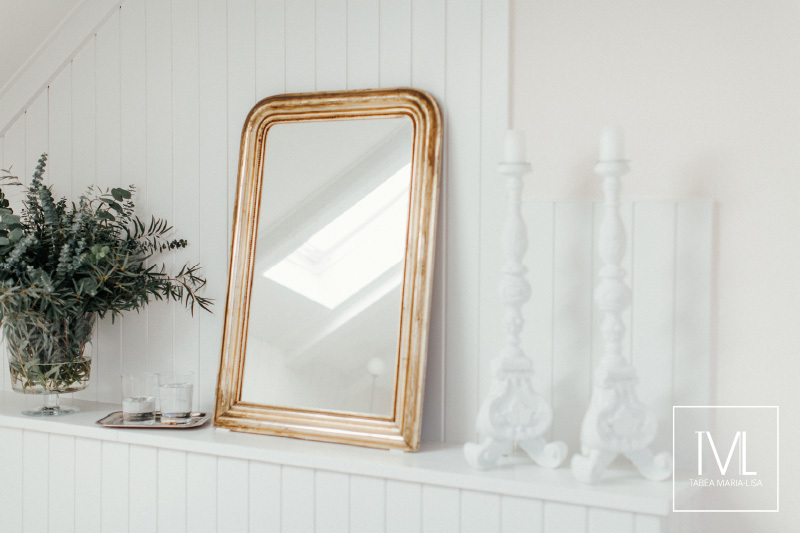 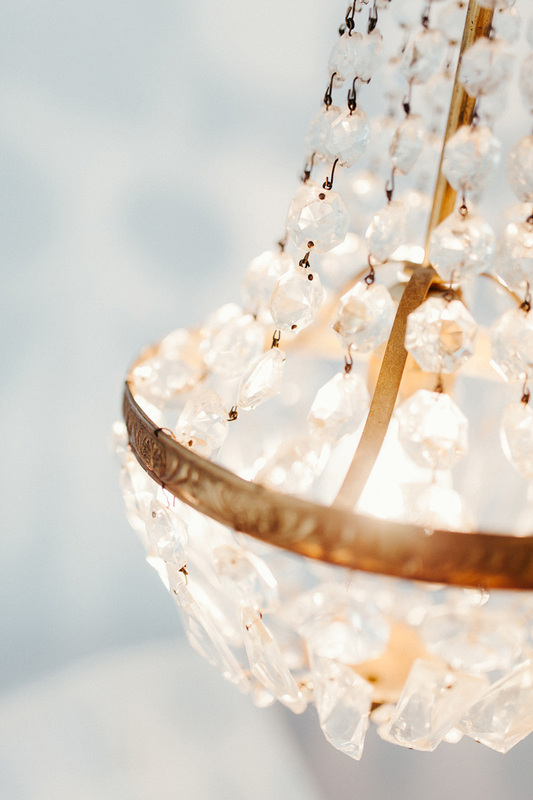 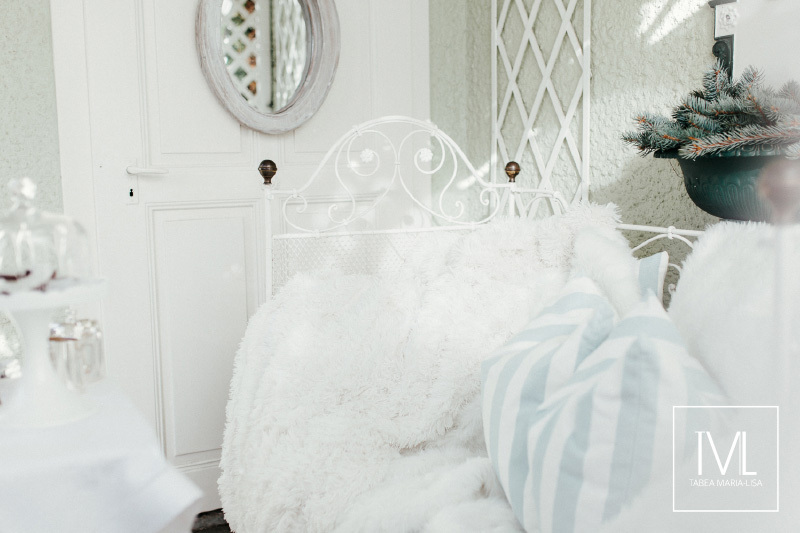 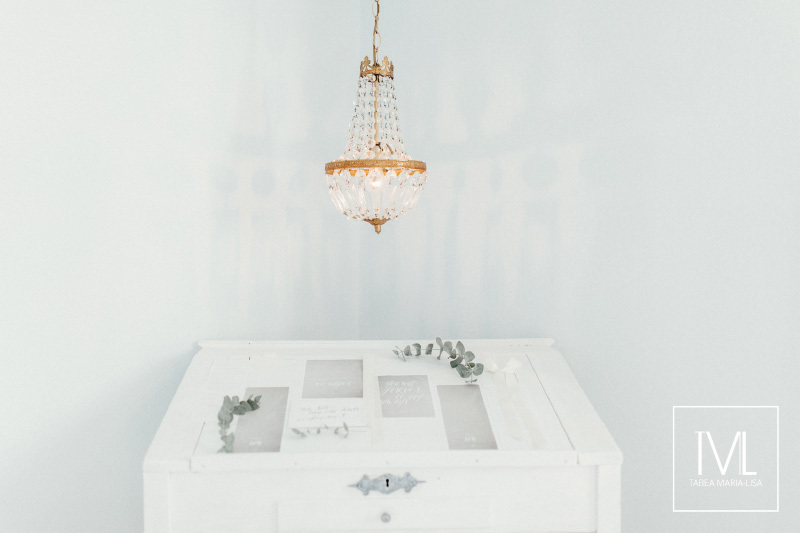 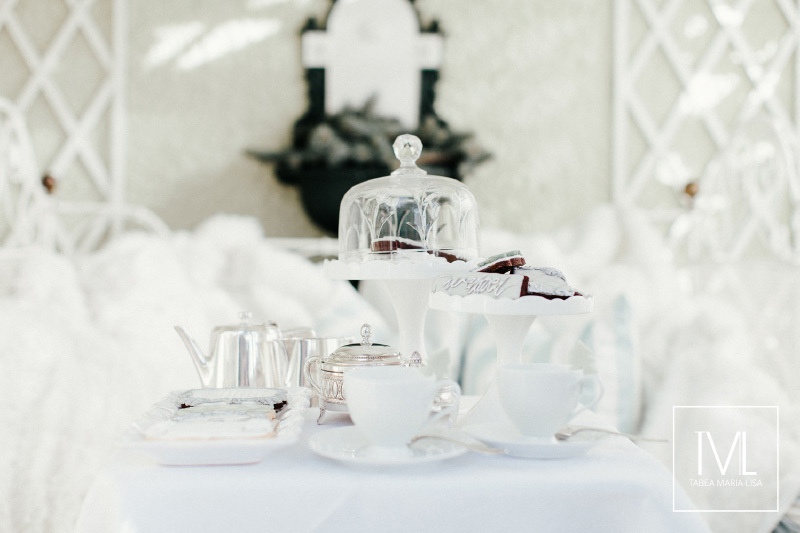 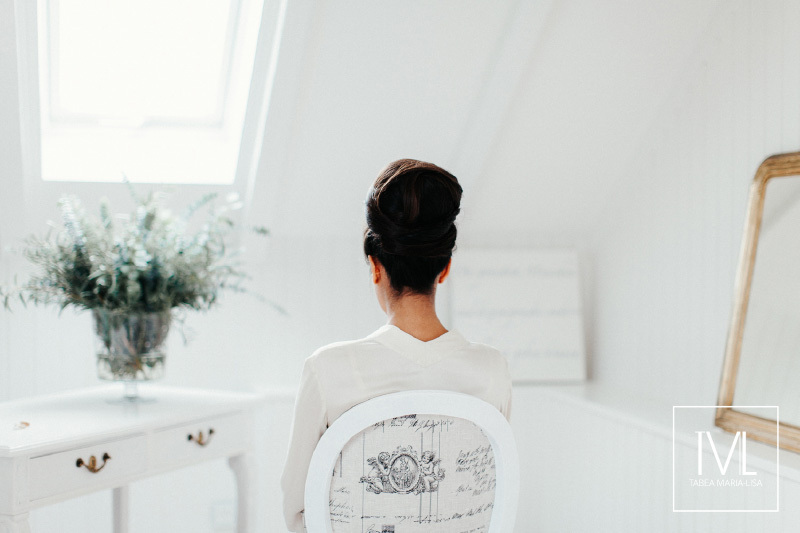 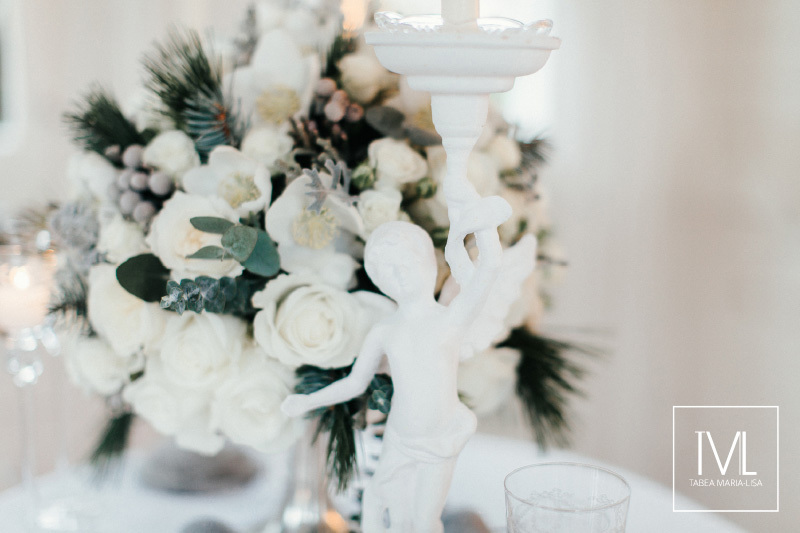 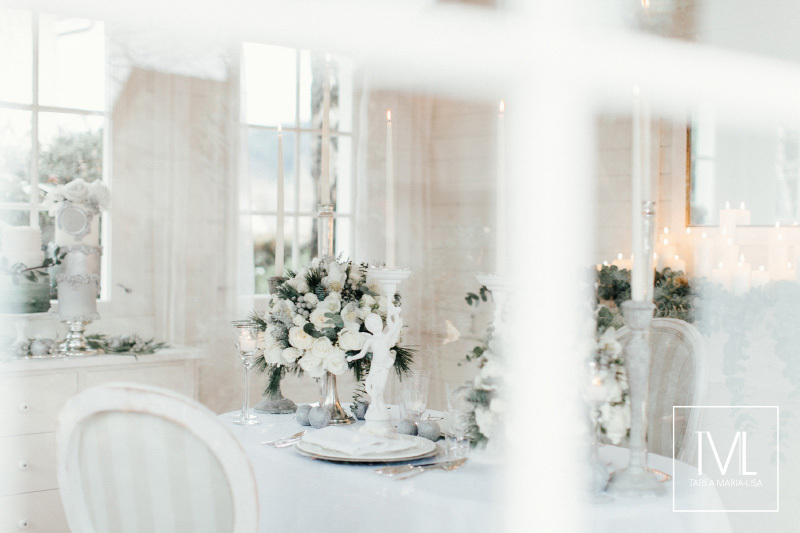 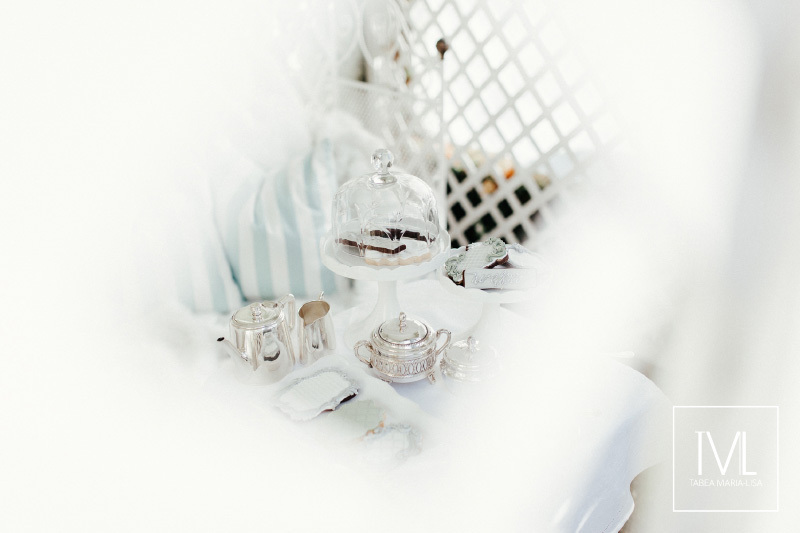 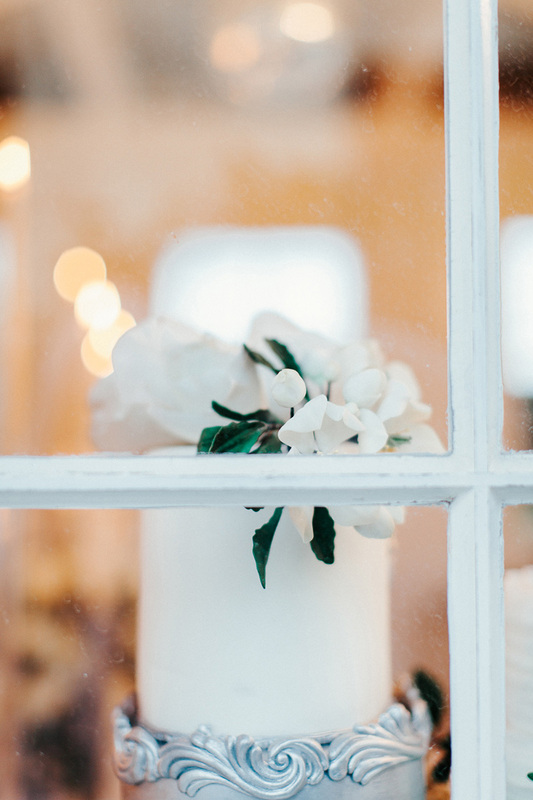 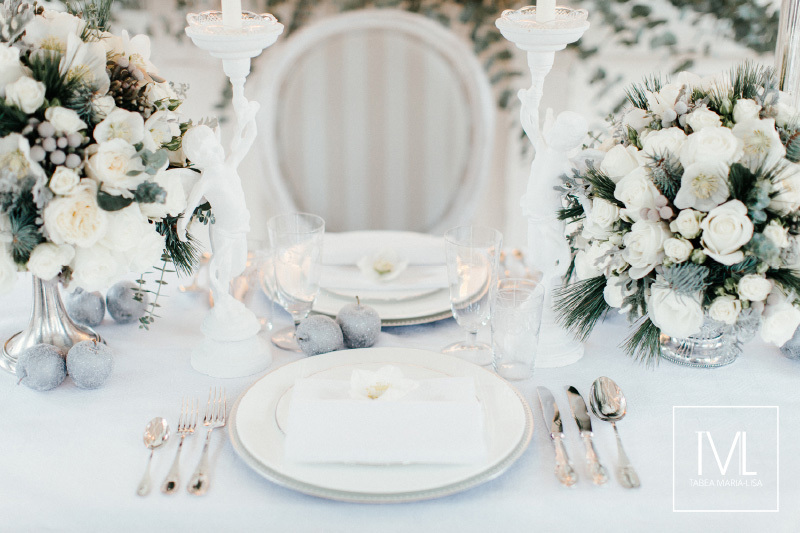 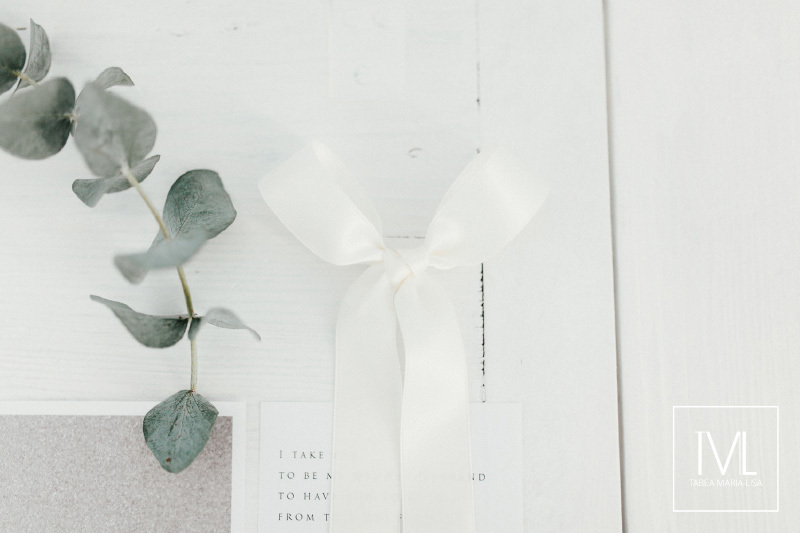 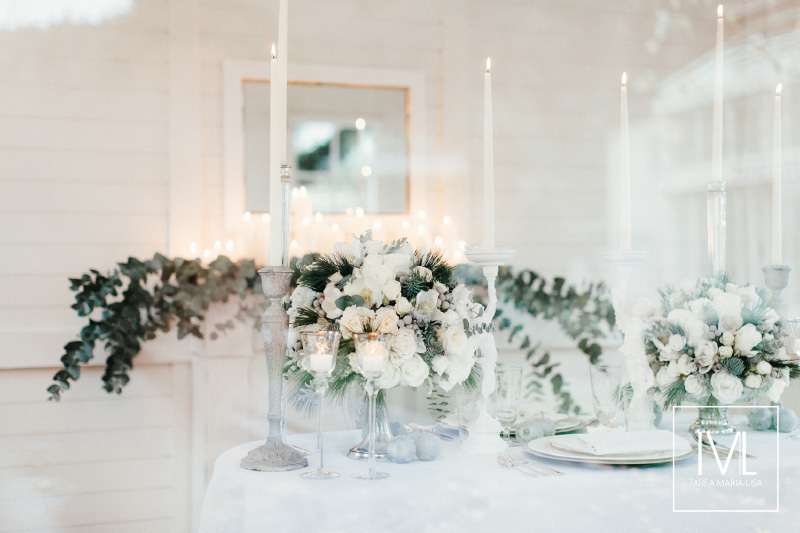 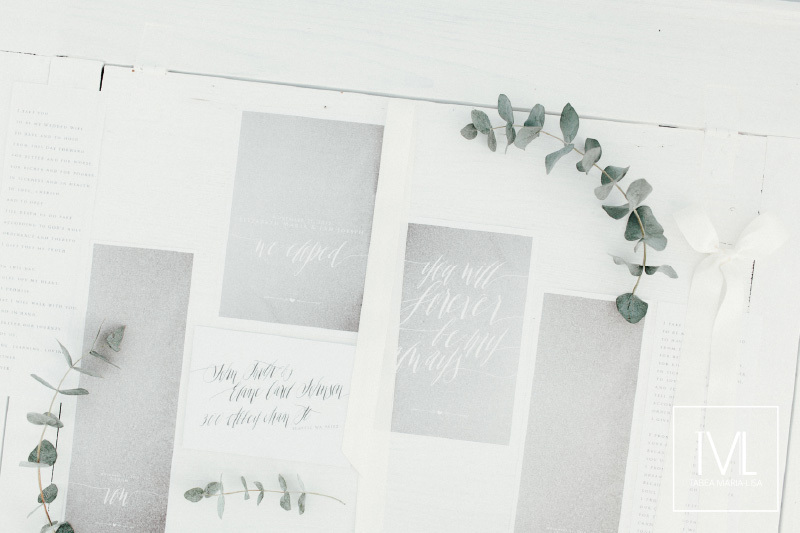 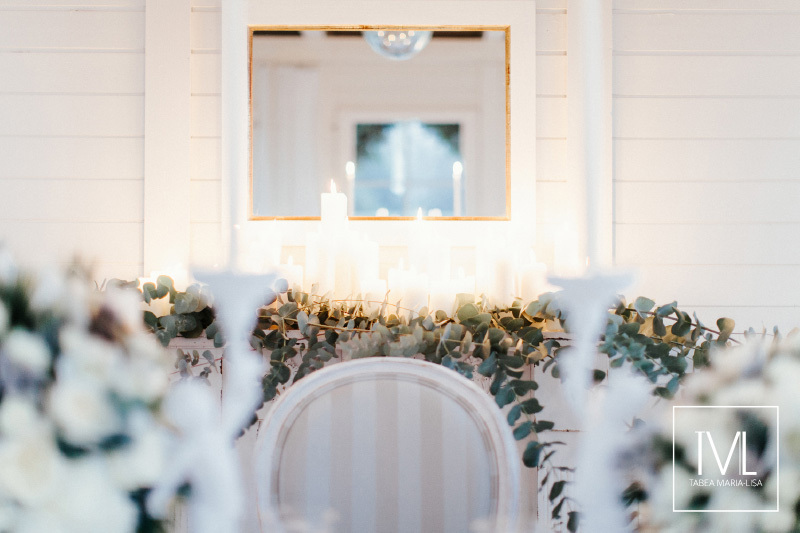 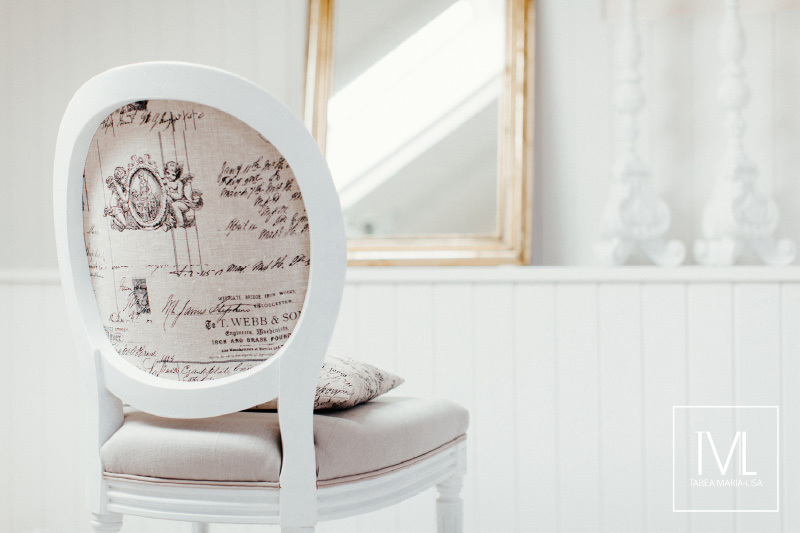 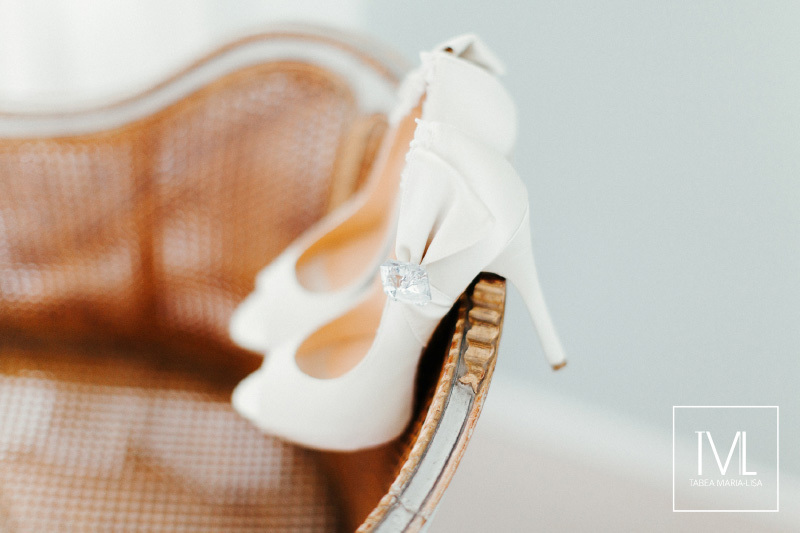 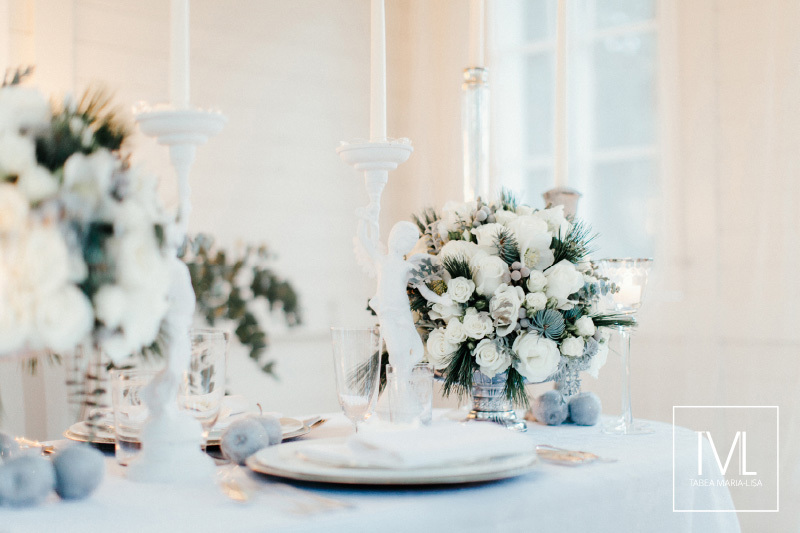 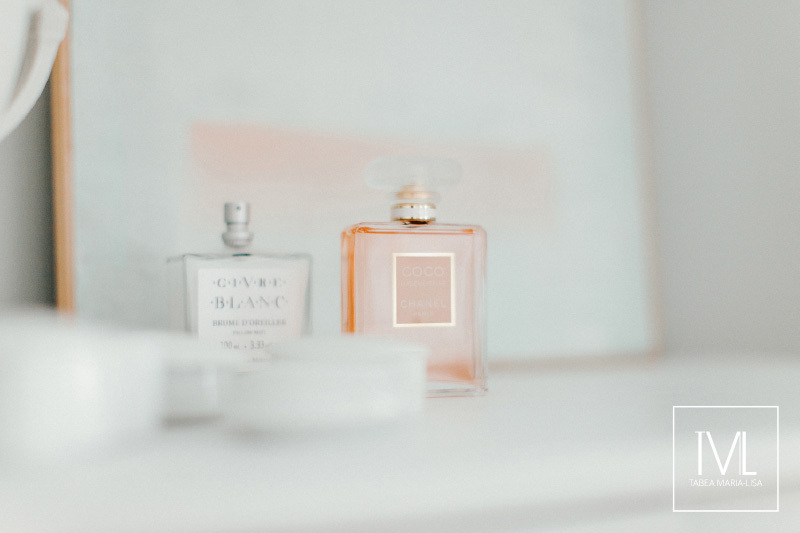 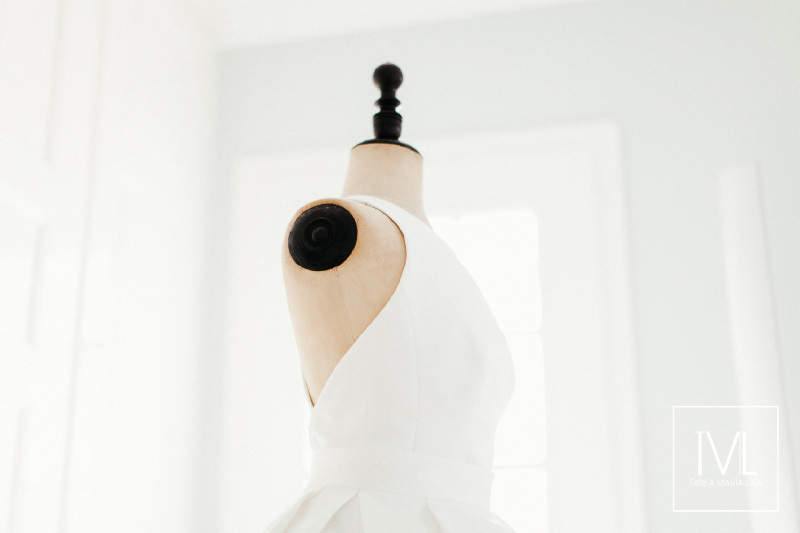 They captured the very soft, calm and serene feeling we wanted to create with our styling so perfectly mostly because they’ve got an eye for the little details that matter so much and because they can make the invisible visible. 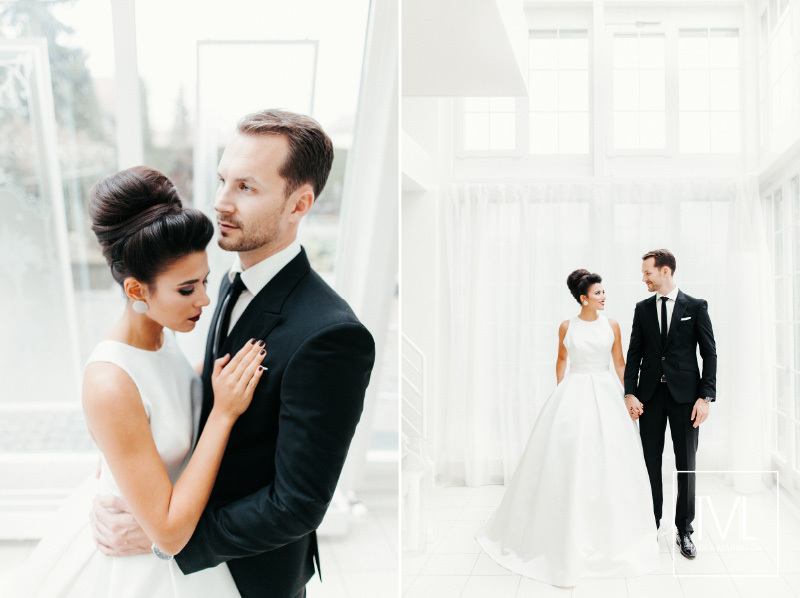 It is obviously that they love two things: intimacy and simplicity. 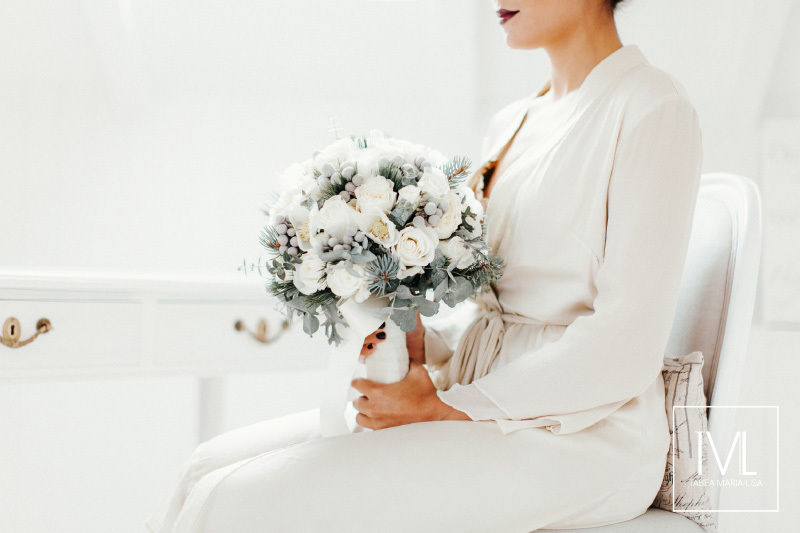 And well for my part: I wanted to create cozy luxuries with the florals and the styling. 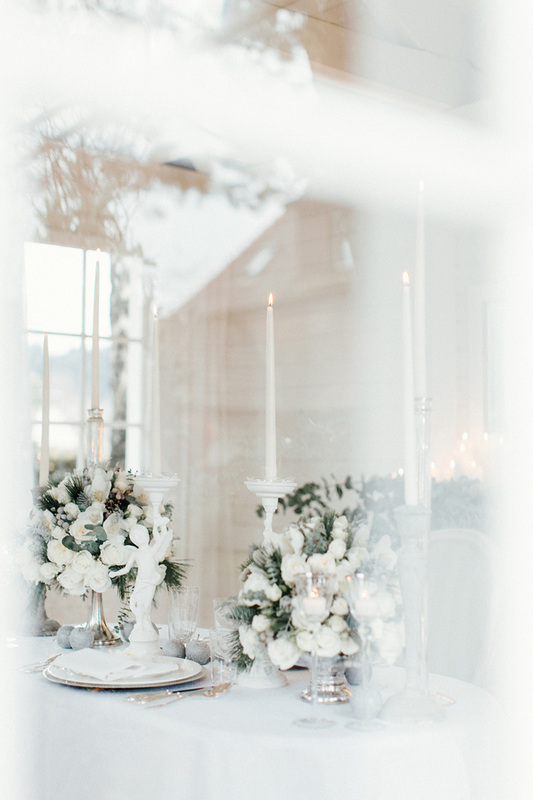 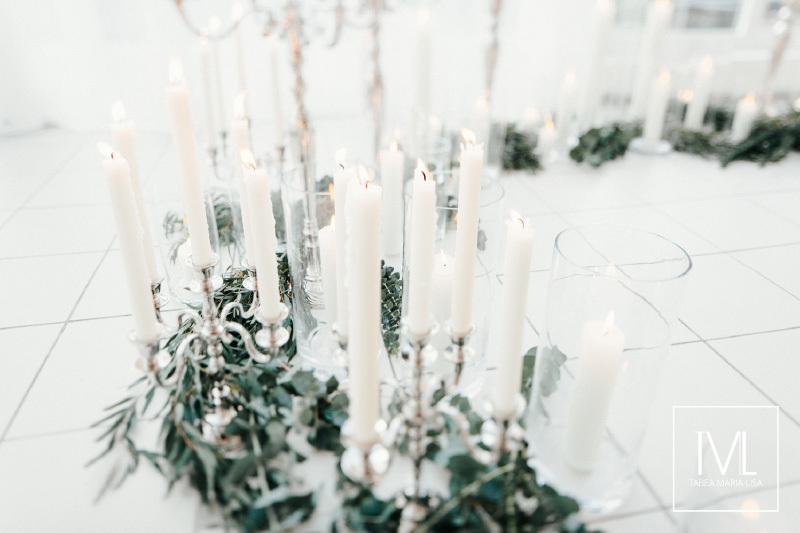 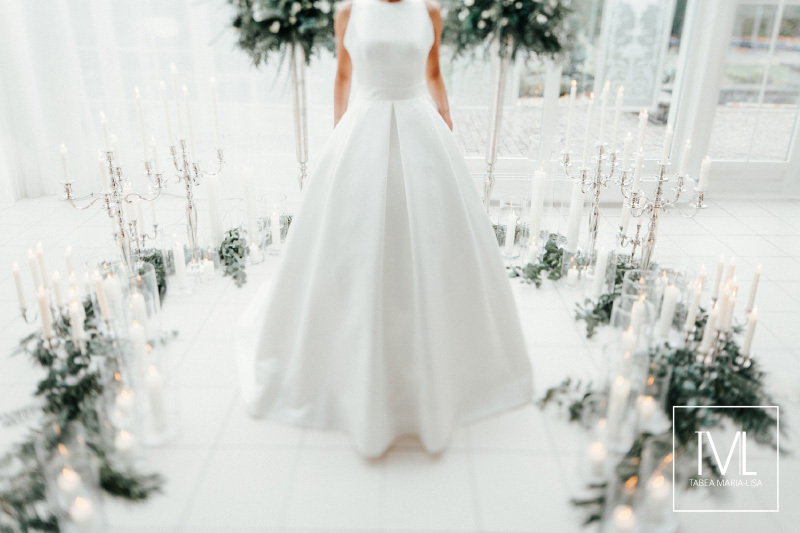 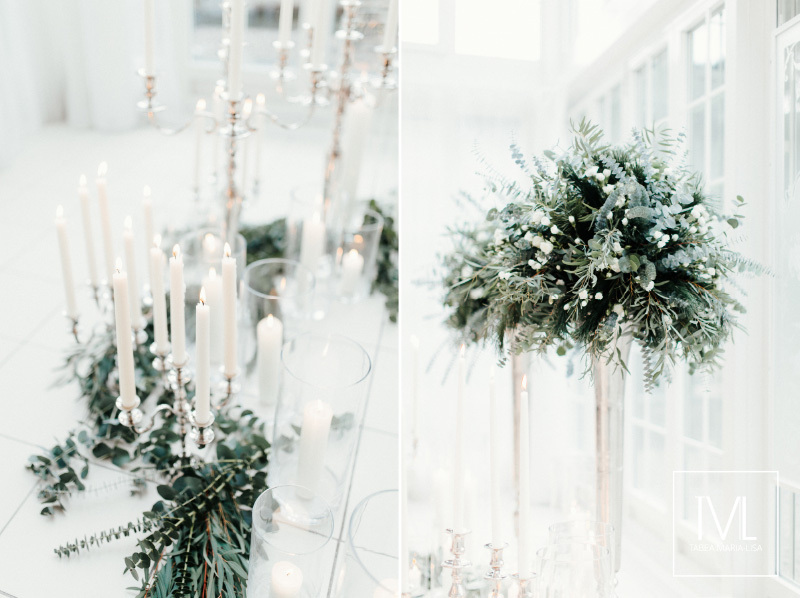 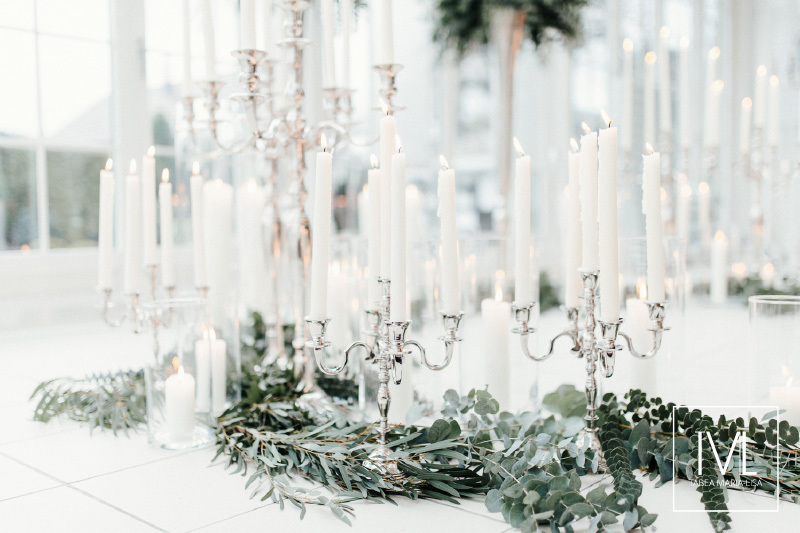 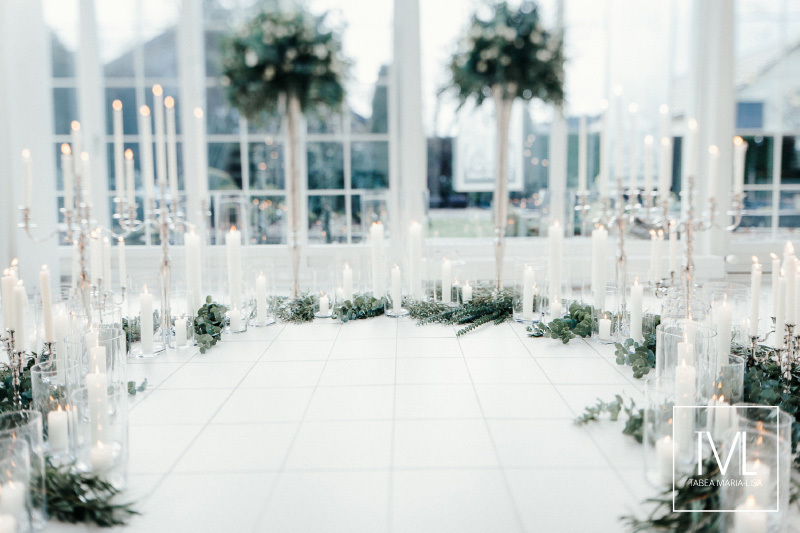 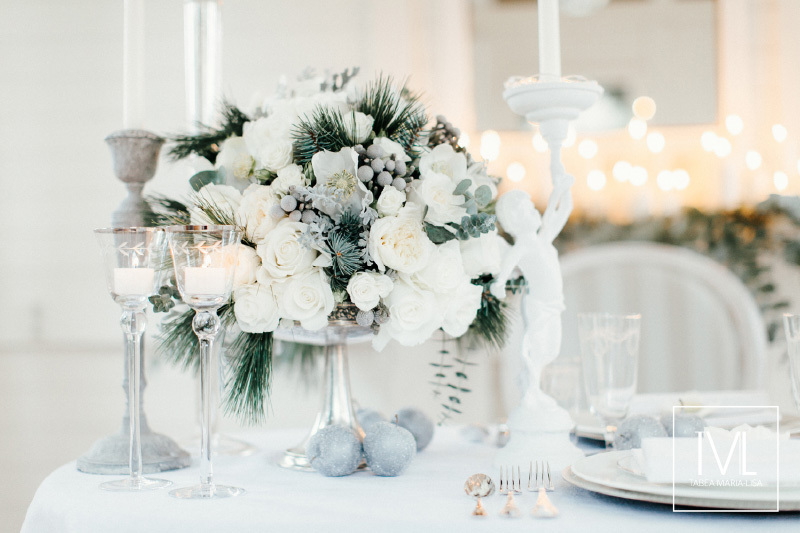 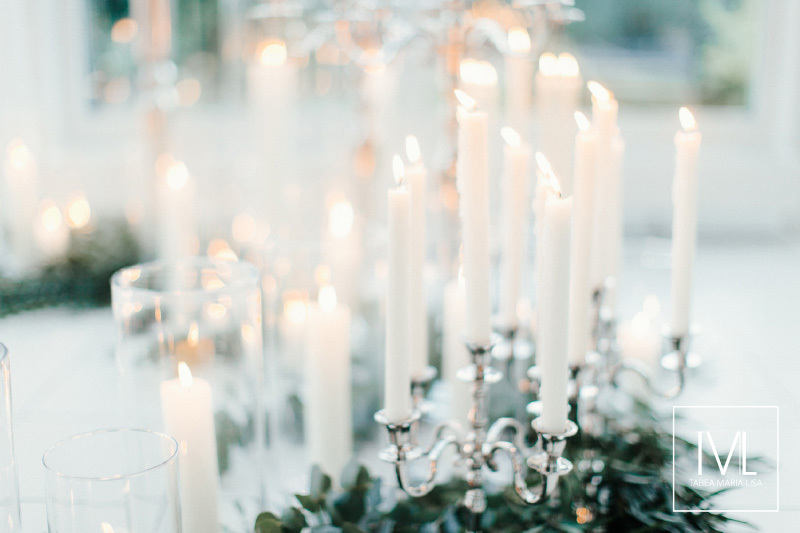 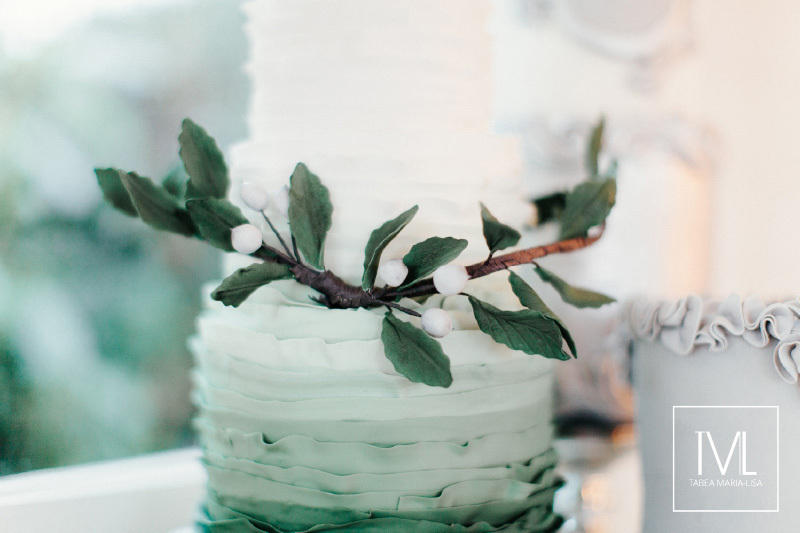 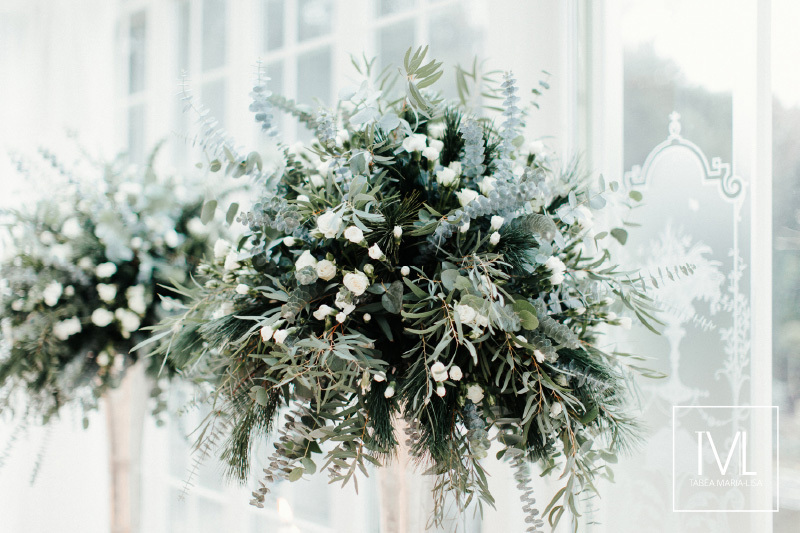 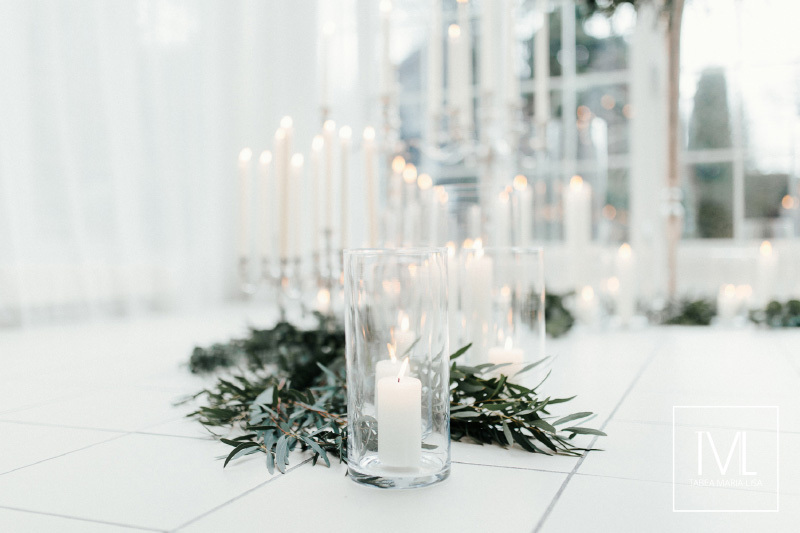 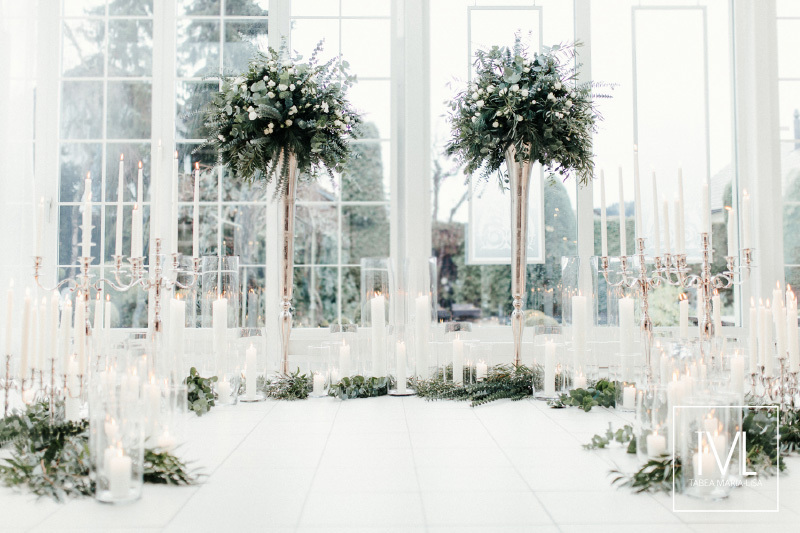 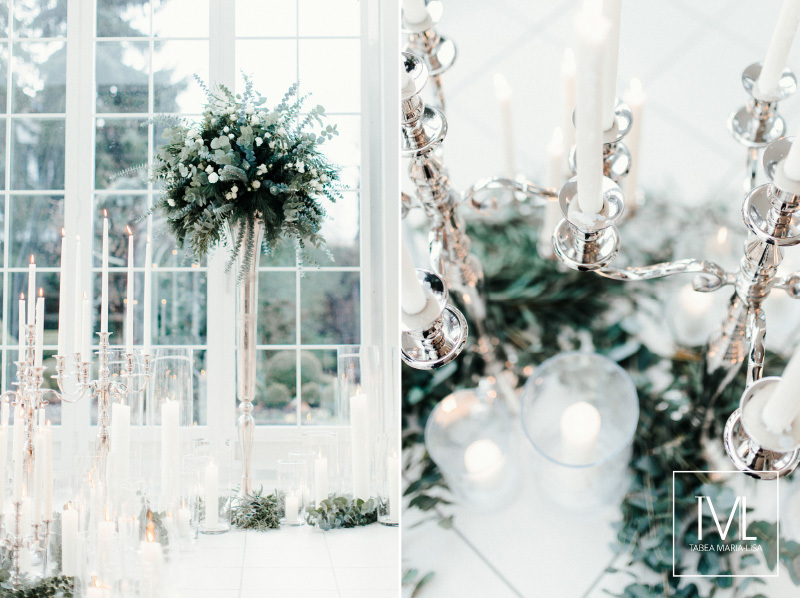 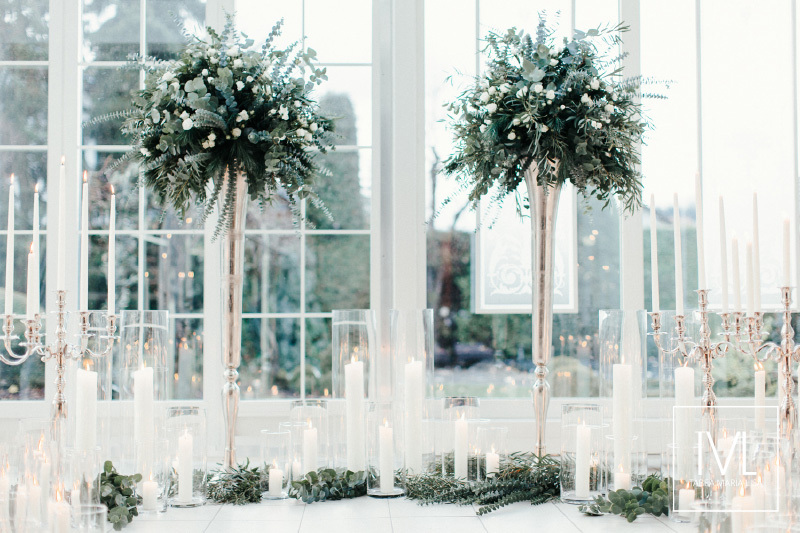 Therefore lots of candles for the ceremony and the reception were needed and I found color inspiration from the soft gray winter fog pulling in silver and from green firs covered in white snow. 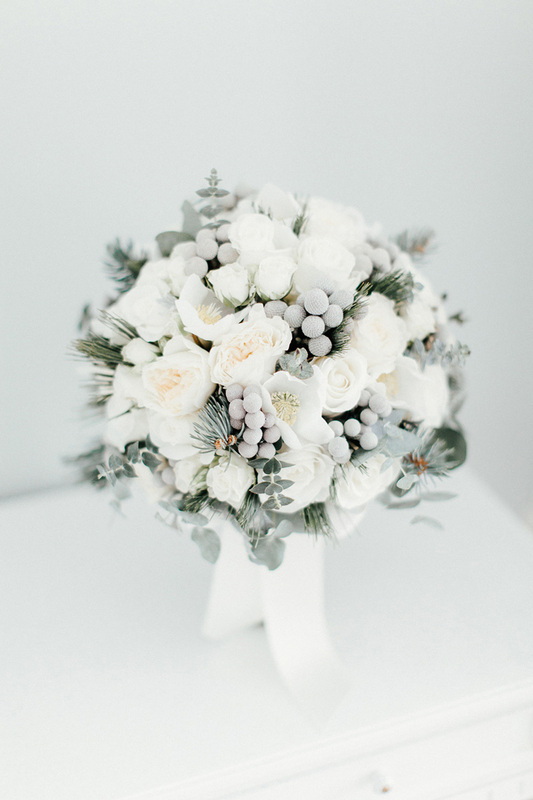 Embracing the winter I created lush floral arrangements with Eucalyptus, Hellebores, Pine and varieties of Roses. 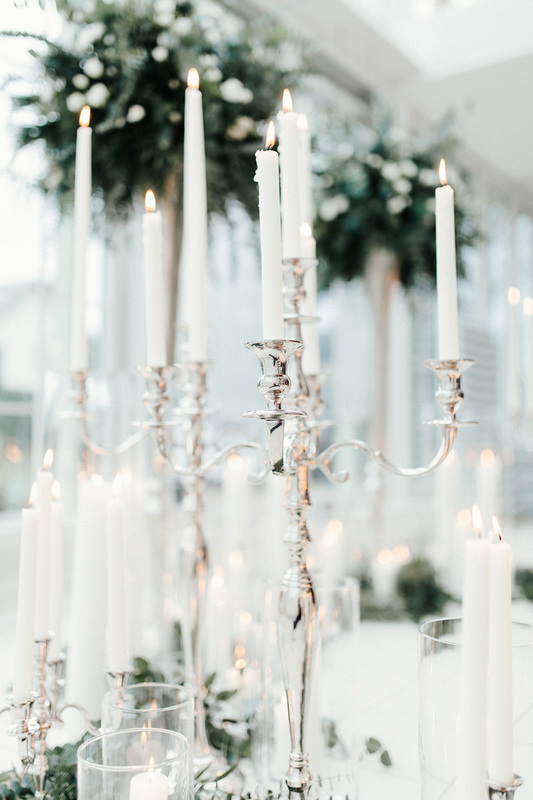 The Design was charmed by antique silver flatware and candle sticks by my beloved mother – not to mention the french inspired interior in the summer house of the private Estate. 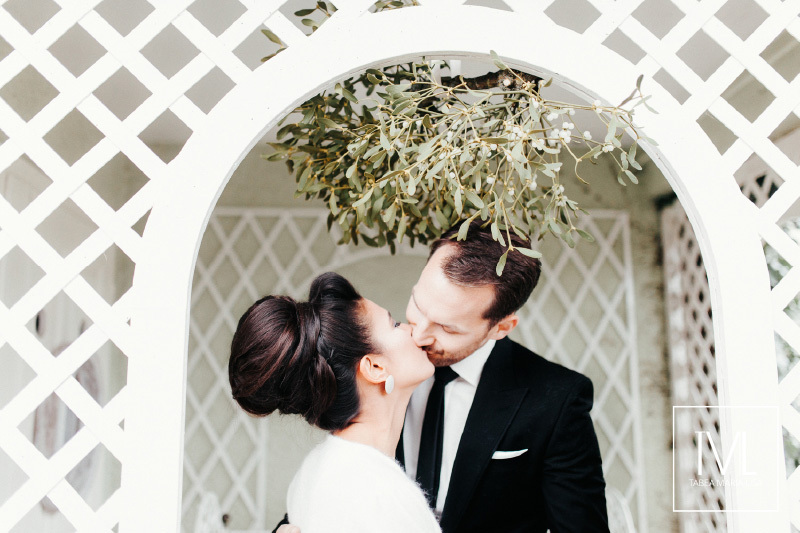 And of course: It wouldn’t have been a winter elopement without a mistletoe.